Sozvezdiya.ru - Astronomy Encyclopedia. G.
Gacrux The star 7 Crucis (of which 'Gacrux' is a contraction); visual mag. 1.59 (but slightly variable), distance 88 l.y., spectral type M4 III. Gagarin, Yuri Alexeyevich (1934-68) Russian cosmonaut who became the first human in space, completing a single orbit of the Earth in the spacecraft Vostok 1 on 1961 April 12 in a flight that lasted 1 hour, 48 minutes. He was the first to experience weightlessness for more than just a few minutes, and the first to see sunrise from outer space. Gagarin, honoured as a Hero of the Soviet Union, was killed during a test flight of a jet aircraft. galactic centre Centre of the Galaxy. It is located in Sagittarius, about 4° west of 7 Sgr (RA 17h 45m.6 dec. -29°00'). Its distance is about 26,000 l.y. Dust clouds along the line of sight to it prohibit direct optical observation, although there are partial clearings of the dust clouds, such as that at BAADE'S WINDOW. X-ray, infrared and radio observations show a complex structure. A radio source, SAGITTARIUS A*, right at the centre, is thought to be a BLACK HOLE with a mass of about 2.5 million solar masses. Surrounding that black hole, and within a few light-years of it, are a dense star cluster, an irregular ring of molecular gas, a gas-free cavity and mini spiral arms. The interactions between these objects are complex and not yet fully understood. galactic cluster Old term for an OPEN CLUSTER of stars. galactic centre A wide- 0° at the galactic centre (RA 17h 46m, dec. -28°56'), field view of the centre of our eastwards to 360° along the galactic equator. See also Galaxy in the direction of CELESTIAL COORDINATES Scorpius, Centaurus and Sagittarius. The dense star galactic pole Either of two points that are diametrically clouds of the Milky Way are in opposite each other in the sky and for which the places heavily obscured by connecting line is perpendicular to the plane of our dark nebulosity. Galaxy. The north galactic pole is in Coma Berenices about 5° west of (3 Com (RA 12h 51m.4 dec. +27°7'); the south galactic pole is in Sculptor, 2° northwest of a Scl (RA 00h 51m.4 dec. -27°7'). The line joining the poles approximately marks the rotational axis of the Galaxy. Galatea One of the small inner satellites of NEPTUNE, discovered in 1989 by the VOYAGER 2 imaging team. Galatea is about 160 km (100 mi) in size. It takes 0.429 days to circuit the planet, at a distance of 62,000 km (39,000 mi) from its centre, in a near-circular, near-equatorial orbit. It appears to act as an interior SHEPHERD MOON to the planet's Adams Ring, and it orbits just beyond the exterior edges of the Lassell and Arago rings. galaxies, classification System of grouping similar GALAXIES together based on the properties of the galaxies' structure. One widely used system is the HUBBLE CLASSIFICATION. galaxy Huge, gravitationally bound, assemblage of stars, gas, dusta and DARK MATTER, an example of which is our own GALAXY. Such objects span a wide range of size, luminosity and mass, with the largest CD GALAXIES being a million times brighter than the faintest known DWARF GALAXIES. The forms of most galaxies fall into the three main types recognized in the HUBBLE CLASSIFICATION scheme. ELLIPTICAL GALAXIES have smooth, elliptically symmetric brightness distributions, and generally have little or no ongoing star formation or cold interstellar gas. SPIRAL GALAXIES may be ordinary or barred; they include central bulges much like embedded elliptical galaxies, surrounded by thin disks that contain cold, dense gas and have hosted star formation over most of the galaxy's history. IRREGULAR GALAXIES have no distinct structure, are generally quite gas-rich, and form stars at a brisk rate. There are also transition S0 (or LENTICULAR) galaxies, which share the bulge and disk structure of spiral galaxies with the old stellar populations of ellipticals. galaxy A general outline for the structure of a spiral galaxy, of which our Milky Way is an example. Seen face-on, the galaxy has a fairly compact nucleus surrounded by an extensive disk containing starrich spiral arms. Seen edge-on, the nucleus is revealed as a bulge, with the spiral arms confined to the flat plane of the disk. The galaxy as a whole is surrounded by a halo of globular clusters. As indicated, the Sun is located midway out in the disk of our Galaxy. A defining property of galaxies seems to be that their internal motions suggest the presence of much more mass, in a more extended distribution, than can be accounted for by all the material that can be directly detected. This material is known as dark matter. Unless there are major modifications to the properties of gravity as we understand them, this enigmatic material makes up 90% of the mass in typical galaxies. The visible (and otherwise detectable) components of galaxies are such minor contributors by mass that the behaviour of dark matter must set the terms for formation of galaxies and the relations among size and mass. Most galaxies collapsed to approximately their present forms and began star formation during a fairly brief epoch in the early Universe. Detailed study of nearby galaxies has suggested a picture in which an enormous gas cloud collapsed from a roughly spherical shape while forming stars, with remaining gas forming the thin disk of spirals in which subsequent star formation has taken place. 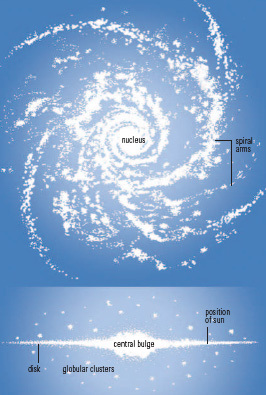 This monolithic collapse ('top down') picture explains some aspects of galaxy structure well, but other aspects require a hierarchical buildup ('bottom up') of galaxies from smaller units (which can be seen today as CANNIBALISM). Galaxy evolution can be observed in several guises. Interactions and mergers can trigger bursts of star formation, resulting in winds that can sweep a galaxy free of gas, and sometimes leave one galaxy in place of two. Tidal encounters may also trigger ACTIVE GALACTIC NUCLEI, particularly QUASARS. 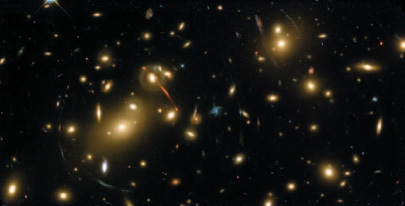 Many galaxies belong to groups or GALAXY CLUSTERS. Rich clusters today contain almost exclusively elliptical and lenticular galaxies, while such clusters at significant redshifts (seen as they were several thousand million years ago) can be rich in spirals. This shift, the Butcher-Oemler effect, shows that the cluster environment can drive galaxy evolution. Tidal encounters or interactions with the hot intracluster medium may be responsible for this change. Galaxy, the Star system or GALAXY that contains our Solar System; the capital G distinguishes it from the many others that can be observed. It is also known as the MILKY WAY after its visual guise: from the northern hemisphere it can be seen as a faint, luminous band that meanders from the deep south in Sagittarius, glides through Aquila and Cygnus, embraces the W of Cassiopeia, then fades gradually past Perseus and Orion to dip once more below the southern horizon in Puppis. Seen from the southern hemisphere the Milky Way is far brighter and more spectacular. From Puppis it flows into Carina, where it is richly textured and bright enough to be seen from within large cities. Continuing bright, it sweeps past the stars of Crux, where an intervening cloud of dusty gas has removed a black scoop from it, the COALSACK. From there a narrow dark streak bisects the Milky Way as it passes through Centaurus, swells and brightens through the tail of Scorpius, and enters Sagittarius. When seen against a dark sky, and when it rides nearly overhead, the Milky Way in Sagittarius reaches its widest, at more than 30° in breadth, still split by a dark central band. That band continues as the Milky Way narrows northwards through Aquila to Cygnus. Northern hemisphere dwellers have termed this dark band the CYGNUS RIFT, but its full extent, one-third of the entire sky, can be appreciated only from the south. The fact that the Milky Way completely circles the sky clearly indicates that we live within it. It is our Galaxy. External galaxies basically have three forms - spiral, elliptical and irregular. The Milky Way is quite symmetrical about the constellation Sagittarius, so it is not irregular. Elliptical galaxies are almost spherical blobs of stars, so if we lived inside one we would see its constituent stars in every direction. Instead, the narrowness of the band of the Milky Way shows that our Galaxy is basically flat, and as such it must be a spiral galaxy. When viewed from the southern hemisphere, a spiral classification is readily appreciated. Our Solar System lies among the spiral arms, so that at least one wraps round outside us like a cloak, while others curl between the centre and us. And, like other spiral galaxies, our Galaxy contains bands of opaque dust clouds along the spiral arms and a central bulge like a miniature elliptical galaxy within the orbit of the arms. That bulge is in Sagittarius, which is why the Milky Way widens there. In front of the bulge passes a prominent spiral arm, which produces the great brightness of the Centaurus-Crux-Carina region. This arm curls away from us in Carina, where, seen effectively end-on, a great accumulation of stars and nebulae causes the extreme brightness and complexity. Immediately outside this arm, and therefore superimposed in front as we view it, is the band of gas and dust, a region where stars have yet to form, that causes the dark rift from Cygnus to Crux. Beyond Carina we see the fainter arm that wraps itself round outside the Sun. It crosses the northern sky, gaining brightness as we follow it gradually inwards towards Cygnus. Although the trained eye easily sees these features, it took a long time for the Galaxy's structure to be deduced. Even today, the details remain contentious, for instance of how many spiral arms it has. RADIO ASTRONOMY has been of paramount importance. In 1931 Karl JANSKY discovered radio emission from Sagittarius, and before long the first maps of the radio sky were made. Apart from a few individual spots of radio emission, which were later to prove of immense importance, these maps showed a band exactly following the Milky Way. The mechanisms producing visible light and radio emission are grossly different, and very few objects liberate both in comparable amounts. Nonetheless, the Galaxy contains sources of both. In the northern sky the radio emission was found to be weak, but it rose to a crescendo in Sagittarius. The difference between the radio and the visible Milky Way was, quite simply, that the radio waves passed unimpeded through the dark clouds. They showed what the Galaxy would be like if we could see all the stars. In particular, they focused attention on the very centre of the Galaxy (see SAGITTARIUS A and GALACTIC CENTRE). As radio astronomy matured it began to make more sophisticated observations. One of the most important of these was the study of radiation by hydrogen atoms at a wavelength of21 cm (see TWENTY-ONE CENTIMETRE LINE). Observations at this wavelength could pick out the gas clouds associated with spiral arms, revealing them irrespective of whether optically opaque clouds intervened. The radio astronomers put together a map of the Galaxy revealing its spiral arms. In practice the Galaxy appeared highly complex, and spiral arms could be sketched through the map only with the eye of faith. More recently, however, similar observations made from Australia, of the less ubiquitous gas carbon monoxide, have painted a much clearer canvas; this map suggests that there are four arms to our Galaxy. The best evidence now suggests that the Galaxy is a BARRED SPIRAL with a HUBBLE CLASSIFICATION of SBc. Our view from within the disk of the spiral arms can never be adequate to disentangle the full structure of the Galaxy. The following description, therefore, is based in part on studies of our own Galaxy and in part on what is known of other spiral galaxies. About 100,000 million stars populate the Galaxy, making it slightly above average in size. It is nearly 100,000 l.y. across, though its outer boundary is not well defined, and we live 26,500 l.y. from the centre. The bulge of stars in the central part comprises those that formed relatively early in the Galaxy's history. These stars have evolved away from the main sequence, many becoming cool giants; those that remain main-sequence stars are small and cool. As a result the average colour of these stars is yellow, and they are collectively referred to as population ii stars. By contrast the disk that spreads even beyond the Sun's orbit, and contains the spiral arms, is a site of star formation, as seen in the orion nebula and similar locations. The integrated light of young stars is dominated by the hottest, brightest specimens, and is therefore blue. These stars are referred to as population i stars. Interspersed among the stars, and especially between the curving spiral arms, are dense clouds that will continue to form new stars for thousands of millions of years. Just like planets round the Sun, the stars of our Galaxy orbit the central bulge. Each star does so at a speed dictated by the mass of material (stars, gas and any unseen objects such as black holes) within its orbit. The stellar orbits are not quite circular, so stars shuffle relative to one another. In the bulge, some orbits are quite elliptical whereas others swing up and down in complex gyrations that may be visualized by drawing a sine wave around the surface of a slightly squashed cylinder. Our Sun circles the galactic centre at about 250 km/s (160 mi/s), taking some 200 million years per orbit. If the motions of the outermost stars of the Galaxy are measured, the total mass can be calculated. This measurement is only partially feasible, because velocities can only be determined along the line of sight (using the doppler effect) and not across it. A further complication is our own motion, itself not very accurately known. Various statistical analyses of the measured motions suggest that the Galaxy's mass is nearly one million million times as much as the Sun, which is nearly ten times the mass of the visible constituents. This extra mass forms a spheroidal halo around the Galaxy some 150,000 l.y. across, which is in turn embedded within a spherical corona, which may be up to 600,000 l.y. in diameter and which includes the magellanic clouds, the globular clusters and some other dwarf galaxies. The Milky Way may have formed the halo and corona through the accretion and tidal breakup of other small galaxies. galaxy cluster Group of galaxies. Galaxies are usually found as members of clusters. Rich clusters can have thousands of members and poor clusters may have only dozens of galaxies. The clustering of galaxies is an important constraint on cosmological models and the degree of clustering in the Universe today is related to the anisotropies in the matter distribution of the early universe. Margaret geller and colleagues at Princeton University have mapped a portion of the Universe and attempts are currently being made to characterize the degree of galaxy clustering using correlation functions. Galilean satellites Collective term for the four largest satellites of jupiter, discovered in 1610 by galileo galilei. They were the first proof that not all motion in the Solar System is centred on the Earth, and it paved the way for the acceptance of the heliocentric theory. Galilean satellites Images from the Galileo orbiter, showing the four large satellites of Jupiter, arranged in order of distance from the planet: (left to right) Io, Europa, Ganymede and Callisto. Little was known about the Galilean satellites until they were seen from close range during flybys by the two voyager probes in 1979. More detailed images were obtained during the 1995-2003 orbital tour by the galileo spacecraft, and repeated encounters cast light on their internal density distributions and detected their magnetic fields. The Galilean satellites show a progressive decrease in density, corresponding to an increase in the ratio of ice to rock, with distance from Jupiter. This observation reflects the higher temperatures that prevailed in the inner part of Jupiter's protoplanetary disk while the satellites were accreting. The innermost satellite, io, has the same structure as a terrestrial planet, with an iron-rich core surrounded by a rocky mantle. The next satellite, europa, has a similar structure overlain by an outer layer of ice. ganymede, the largest of the four, is composed of a roughly 40:60 ice-rock mixture, and its interior appears to be fully differentiated (see differentiation), with an iron-rich inner core, a rocky outer core and an icy mantle. callisto, the outermost Galilean satellite, is slightly less dense and appears to be only weakly differentiated. tidal heating is responsible for present day volcanic activity on Io and the recent break-up of Europa's surface, where there may well be an ocean below the ice. It may also account for the substantially different evolution of Ganymede and Callisto. Galilean telescope refracting telescope having a plano-convex objective and a plano-concave eyepiece. It forms an erect image and gives a small field of view. This type of instrument, first employed by galileo to make astronomical observations, is no longer used in astronomy, but the same optical system is still used in opera glasses. Galileo First spacecraft to orbit the giant planet jupiter and to deploy an atmospheric probe into the Jovian atmosphere, in 1995 December. It was launched by the national aeronautics and space administraion (NASA) in 1989 October aboard the Space Shuttle and deployed initially in Earth orbit. The launch had originally been planned for 1986 May but was delayed by safety concerns about flying Galileo with a cryogenic upper stage on the Shuttle after the Challenger accident. Soon after deployment, it was discovered that the spacecraft's large, high-gain antenna had not deployed fully, jeopardizing the success of the mission's ability to transmit data. Corrections to software and systems meant that the spacecraft's loss could be compensated in part, although transmission of data took longer and contained less information. Galileo flew to Jupiter via a gravity assist flyby of Venus in 1990 February and two flybys of the Earth in 1990 December and 1992 December. The spacecraft's path allowed it also to visit two asteroids, marking a space first in 1991 October with a flyby of gaspra. 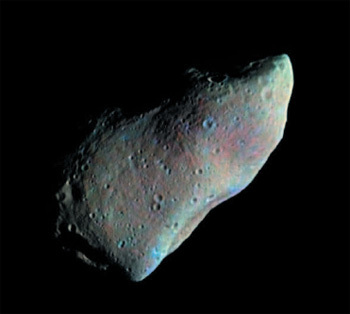 The asteroid ida was explored in 1993 August. 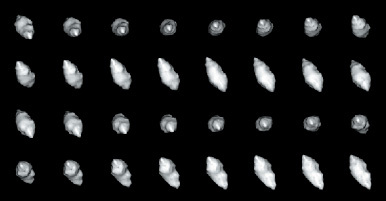 Close-up images of both asteroids at a minimum distance of 1600 km (1000 mi) and 2410 km (1500 mi) respectively were taken. Galileo Repeated passes close to the four large satellites of Jupiter by the Galileo orbiter since 1996 have revealed these in more detail than ever before. This image shows the volcano Zal Patera on Io. In 1995 July, the atmospheric probe was deployed, some 80 million km (50 million mi) from Jupiter, and both spacecraft headed towards a rendezvous with the planet. The probe entered the Jovian atmosphere on 1995 December 7 and transmitted data for 57 minutes during a 152-km (95-mi) descent under a single parachute, transmitting data to Galileo as it was preparing to enter orbit the following day. Transmission of the probe data to Earth was completed by 1996 April. The data revealed an intense radiation belt 50,000 km (31,000 mi) above the clouds, a Sun-like hydrogen-helium ratio, some organic compounds, one cloud layer and 640 m/s (2000 ft/s) winds below the cloud deck. Thunderstorms many times larger than Earth's result from the vertical circulation of water in the top layers, leaving large areas where air descends and becomes dry and other areas where water rises to form thunderstorms. Galileo began its tour of the Jovian satellites, which continued until 2002, with a flyby of GANYMEDE, followed by several further encounters with this and the other main moons. Galileo established that the ring system is made of small grains blasted off the satellites' surfaces by meteoroid impacts. IO was found to be the Solar System's most volcanically active body, while EUROPA has a possible salty ocean containing more water than does Earth. Ganymede has a magnetic field and CALLISTO may also have a water ocean. In 2000 December, Jupiter was for the first time in space history explored by two spacecraft simultaneously, with Galileo's observations being complimented by those from CASSINI en route to Saturn during the 'Millennium Flyby'. Galileo Galilei (1564-1642) Italian astronomer, physicist and mathematician. He was one of the first to use the telescope for astronomical observations, discovering mountains and craters on the Moon, and four satellites of Jupiter now known as the Galilean satellites. He observed the phases of Venus, and studied sunspots, from whose motion he deduced that the Sun rotates. Galileo concluded that ARISTOTLE's picture of the world, still widely believed in his time, was wrong and he championed COPERNICUS' heliocentric theory. This brought him into conflict with the Catholic Church and led to his trial and house arrest for the last eight years of his life. Born in Pisa, the son of a lawyer and musician Vincenzio Galilei, Galileo was educated at the universities of Pisa and Padua. At first he studied medicine, but abandoned it for mathematics. Early in his career, he developed the fondness of controversy that would play a major part in precipitating his condemnation in 1633. One body of opinion in the universities of his day, which Galileo came first to criticize and then to openly ridicule, was the interpretation of all natural phenomena in terms of the philosophy of Aristotle, with its axiomatic assumption that the Earth stood fixed at the centre of the Universe (see GEOCENTRIC THEORY). It is all too easy for us to sympathize with Galileo's attacks upon Aris-totelianism, and take his polemical language at face value when he called his Aristotelian contemporaries 'simpletons'. Yet even by the time of his death in 1642, let alone in 1600, there was no known physical proof of the Earth's motion in space, and Copernicus' theory hinged more upon mathematical elegance than upon observed fact. Galileo's youthful anti-Aristotelianism was confirmed by a series of experiments in physics. The first of these, dating from his time in Padua in 1583, made him realize that when a pendulum swings, the determining physical factor is not the heaviness of the bob, but the length of the pendulum itself. Likewise, the results of his researches in Padua, where he became professor of mathematics in 1592, further contradicted Aristotle, for it was clear that the rate of acceleration of a falling body is governed by a fixed mathematical law that has nothing to do with the weight of the body. In Aristotle's philosophy there was no place for such laws. Terrestrial events were caused by an intermixing of earth, water, air and fire; only the heavens displayed mathematical regularities. Yet Galileo had shown that terrestrial as well as celestial motions conformed to exact mathematical laws, and he can be said to have established physics as a discipline founded on mathematical theory and experiment. But it was his astronomical work that made Galileo famous, to become by the end of 1610 Europe's first scientific celebrity. Even before 1600, he was convinced of the truth of the heliocentric COPERNICAN SYSTEM. His conviction derived from Copernicanism's mathematical elegance in explaining the retrograde motions of planets, combined with his own anti-Aristotelian conclusions in physics. But when he first used the newly invented telescope to observe the night sky over the winter of 1609/10, he saw things that he felt secured the Copernican case. He found that the Moon's terrain was mountainous, not the smooth surface Aristotle had predicted. He also found that even under the X30 magnification of his most powerful telescope, the Milky Way fragmented into millions of individual stars, and that instead of a few thousand stars being attached to the inside of a black dome, as the ancients had taught, there seemed to be countless millions extending throughout space. And then, in 1610 January, he discovered that the classical 'wandering star', Jupiter, was a spherical world, with four tiny satellites orbiting it. (Simon MARIUS later claimed to have observed them first.) Very obviously, the Earth was not the only centre of rotation in the Universe. These and other telescopic discoveries by Galileo were published in 1610 March as Siderius nuncius, 'The Starry Messenger', and won him renown across Europe. All these discoveries, along with that of the phases of Venus (which showed that Venus revolved around the Sun) and, in 1611, of sunspots (which showed that the Sun was not an unblemished golden sphere), added to the weight of evidence against Aristotle's ideas, yet failed to provide physical proof that the Earth was in motion. For that, a stellar parallax or some similar phenomenon was needed, and instruments would not become sufficiently accurate to measure such a parallax until 1838. Galileo's advocacy of Copernicanism thus rested not upon being able to prove the heliocentric theory, but upon his skill in undermining the objections of conservative astronomers who still adhered to Aristotle and Ptolemy. And as he could be very mocking to his opponents, Galileo made enemies, especially in the Jesuit order, whose Christoph SCHEINER had co-discovered sunspots, and yet had interpreted them in accordance with Aristotelian criteria. In the wake of his 1610 discoveries, however, Galileo had won the patronage of the Medici family, who had invited him to their Grand Ducal Court in Florence. The now famous Galileo was elected to the prestigious Accademia dei Lincei ('Academy of Lynxes') and left Padua to become a scientific courtier and holder of a research chair at Pisa. In Florence, he was lionized by the Medici and moved on easy terms amongst ambassadors, cardinals and bishops. In 1616, however, Galileo was officially prohibited by Cardinal Bellarmine from teaching Copernicanism as the truth, as opposed to a hypothesis. Wisely, Galileo - who was a sincerely devout Catholic - complied, but when his friend Cardinal Barbarini became Pope Urban VIII in 1623, he attempted unsuccessfully to have the 1616 prohibition lifted. Nonetheless, in 1632, when the Church granted permission for his dialogues to be published, he believed that he had the right publicly to discuss Coperni-canism. However, Galileo's ensuing condemnation in 1633 was not for a serious heresy (the Church then had no official line for or against Copernicanism) but was disciplinary, for breaching the prohibition of 1616. Even so, the elderly Galileo's condemnation to house arrest at his villa at Arcetri, Florence (where he also discovered the lunar libra-tion) shocked scientists across Europe. But no further Copernicans were punished, and one wonders how far Galileo's provocative personal style, the enemies he made in the Jesuit order, and the undoubted pride of Pope Urban VIII (who felt personally slighted by Galileo), rather than the science itself, were responsible for his fate. The Catholic Church re-opened the Galileo affair in 1822, and in 1992 Pope John Paul II proclaimed Galileo's complete exoneration, and offered the Church's apologies. Galileo National Telescope (TNG) In Spanish, the Telescopio Nazionale Galileo, a 3.5-m (138-in.) optical/infrared telescope completed in 1997 as an Italian national astronomy facility. It is located at the ROQUE DE LOS MUCHACHOS OBSERVATORY on the island of La Palma at an elevation of 2358 m (7740 ft). It is operated for the Consorzio Nazionale per l'Astronomia e l'Astrofisica (CNAA) by the Centro Galileo Galilei. The TNG is closely modelled on the ESO's NEW TECHNOLOGY TELESCOPE. Gamma Cassiopeiae star (GCAS) Rapidly rotating VARIABLE STAR of class Be III-V; it occasionally sheds material into surrounding space, generally from the equator, at apparently random intervals, in what are termed 'shell episodes'. Gamma Cassiopeiae stars may be subdivided into BE STARS, where the ejected material forms a ring around the star, and SHELL STARS, where it forms a circumstellar shell. They are related to, but less extreme than, the S DORADUS STARS. gamma-ray astronomy Research covering the energy range of the ELECTROMAGNETIC SPECTRUM higher than 30 keV (wavelength less than 0.04 nm), essentially the last part of the spectrum to be explored. The extreme penetration of gamma rays makes them valuable for probing regions of the Galaxy and beyond where other radiation is absorbed. COSMIC RAYS were first thought to be a form of gamma radiation, and many gamma rays are produced by interactions of cosmic rays with the gas in the interstellar medium. However, generally gamma rays are associated with the most energetic mechanisms in the cosmos. There are several places where gamma rays are produced: cosmic rays interacting with gas in molecular clouds; SUPERNOVA REMNANTS,where cosmic rays accelerated in the supernova explosion interact with nearby gas; massive stars producing gamma rays in their winds; and PULSARS. gamma-ray burst GRB 00131 was detected by several spacecraft on 2000 January 31. This series of images obtained with the Very Large Telescope (VLT) shows the fading visible-wavelength afterglow, just left of centre. INTEGRAL is due for launch by ESA in 2002 and GLAST is due for launch by NASA in 2006. At the highest gamma ray energies (around 0.2 TeV and above), ground-based telescopes can detect CERENKOV light from the passage of gamma rays in Earth's atmosphere. There are now several Atmospheric Cerenkov Imaging Telescopes (ACITs) which record the flashes (some ACITs have several dishes). Most of their results have been received in the 300 GeV to 30 TeV range. The gamma-ray view of the sky in this energy range looks rather similar to the visible picture, in that there is a general concentration of emission in the galactic plane and an increase in the general direction of the galactic centre. Galactic gamma-ray radiation will be produced mostly by cosmic rays interacting with the gas in the interstellar medium. The lower-energy gamma rays (below about 100 MeV) are produced by electrons, and the electron intensity is higher in the inner Galaxy than locally and in the outer Galaxy. However, the poor angular resolution of the gamma-ray telescopes has led to many problems, particularly with the nature of the 'hot spots' of emission. Some of these are genuine discrete sources in that they can be identified by their time profile with pulsars, for example the CRAB PULSAR and the VELA PULSAR. The X-ray binary SS433 was detected in gamma rays, including some spectral lines. The Energetic Gamma Ray Experiment Telescope (EGRET) instrument on CGRO found around 170 high-energy (above 100 MeV) sources in the Galaxy; the brighter sources were in the galactic plane, the fainter ones in the solar neighbourhood, and a large number of sources were found to lie in GOULD'S BELT, a series of local star-form ing regions. Several of the sources may be older pulsars, or other types of compact objects (such as BLACK HOLES) from past massive star formation. or massive hot stars. Gamma rays have been detected from extragalactic sources such as ACTIVE GALACTIC NUCLEI (AGNs). quasars and BL LACERTAE OBJECTS. EGRET also discovered a class of objects called BLAZARS, which are quasars emitting most of their radiation in the 30 GeV to 30 MeV range, and which are variable on a timescale of days. 3C 279, at a distance of 4 billion l.y., is a blazar (but no longer regarded as typical) and in 1991 it was one of the brightest gamma-ray objects in the sky. The Imaging Compton Telescope (COMPTEL) on CGRO produced a map of the sky in the aluminium-26 line (1.809 GeV), in which the Cygnus, Vela, Carina and the inner Galaxy regions appear brightest. This radioactive element is produced during NUCLEOSYNTHESIS in supernovae. Another map of the sky was created in the 511 keV line, from positron-electron annihilation, which shows that this is occurring in a region around 10° in diameter centred on the galactic centre. Apart from the considerable strength, the emission is variable on the scale of a year - a possible explanation is there is a black hole at the galactic centre that somewhat irregularly consumes interstellar gas. gamma-ray burst (GRB) Short-duration (typically 1 to 10 seconds) outpouring of gamma rays, usually in the energy range from 100 keV to 1 MeV, from a discrete source. Some gamma-ray bursts may be shorter or longer (up to a few hundred seconds), while energies as high as the TeV range may occasionally be recorded. The optical counterparts are found to be young galaxies at high redshifts, which makes GRBs extremely energetic events. GRBs were discovered by satellite-borne detectors meant to monitor violations of the Nuclear Test-Ban Treaty in 1967. In 1997 astronomers found that the GRBs are followed by an X-ray 'afterglow', which enabled their positions to be accurately pin-pointed. The BATSE instrument on the COMPTON GAMMA RAY OBSERVATORY (CGRO) detected 2704 GRBs using NaI detectors, sensitive to energy between 20 keV and 600 keV. In 1999 a GRB detected by CGRO was observed 22 seconds later by a ground-based robotic telescope (due to the automatic alert system), thus providing an accurate position, which meant that observations could be made in X-rays and optically with the HUBBLE SPACE TELESCOPE, PALOMAR and KECK. The 24th-magnitude galaxy had a peculiar shape and was very blue, suggesting that many new stars were being formed. It had a redshift of 1.6, which showed that it was around 10 billion l.y. away. It has been suggested that gamma-ray bursts occur when neutron stars collide or when there is a hypernova. Gamow, George (1904-68) Ukrainian-American nuclear physicist and cosmologist, born Georgy Anthonovich Gamov, known for his theory of the atomic nucleus, the application of nuclear physics to problems of stellar evolution, and his model of a 'hot' BIG BANG; and for his later work in molecular biology. From his early work as a nuclear physicist in Russia, Gottingen and Copenhagen came his theory of ot-decay (1928) and the 'liquid-drop' model of the nucleus (1931), which later proved essential for explaining nuclear fission and fusion. He emigrated to the USA in 1933, becoming professor at George Washington University (1934-56) and the University of Colorado (1956-68). Gamow solved the problem of how the relatively low collision velocities of nuclei in the interior of stars could trigger NUCLEAR REACTIONS. He showed that stars heat up as they exhaust their nuclear fuel. In World War II, he worked on the US Manhattan Project to develop the atomic bomb. After the war, Gamow turned to the Big Bang theory. He visualized the early universe as composed of hot dense matter he called 'ylem', a soup of neutrons, protons, electrons and radiation, from which the first elements were created. With Ralph Asher Alpher (1921- ) and Hans BETHE, Gamow further developed this model, subsequently dubbed 'o-p-y', to show that hydrogen nuclei could fuse to form helium nuclei (o-particles) in quantities that reflected the Universe's observed helium abundance (1 part in 12), but that heavier elements were not produced in the Big Bang. Gamow's greatest insight was that subsequent expansion of the universe would cool the 'cosmic fireball' of radiation left over from the ylem stage to about 10 K in the present. The 3 K COSMIC MICROWAVE BACKGROUND radiation discovered in 1965 by Arno PEN-ZIAS and Robert Wilson confirmed Gamow's prediction. Ganymede Largest of the GALILEAN SATELLITES of JUPITER; it is the largest satellite in the Solar System. Ganymede's diameter of 5262 km (3270 mi) makes it 8% larger than Mercury, but it is a mainly icy body, with a density of only 1.94 g/cm3, and has less than half Mercury's mass. 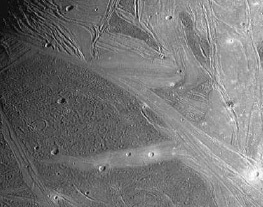 It has a complex, but fairly heavily cratered, icy surface, attesting to major resurfacing events in the distant past, thanks to Ganymede's 1:2 orbital RESONANCE with EUROPA, which presumably caused TIDAL HEATING. Ganymede A Galileo orbiter view of Marius Regio and Nippur Sulcus on Ganymede. These alternating areas of light grooved terrain and darker cratered terrain are typical of the satellite’s surface. Ganymede's density suggests that, like CALLISTO, it consists of a 40:60 mixture of rock and ice. Its icy surface is much dirtier than Europa's, with an albedo of only 0.45. Gravity measurements made by the GALILEO spacecraft indicate that Ganymede has undergone full DIFFERENTIATION, with an iron inner core (filling 22% of its radius), a rocky outer core (filling 55% of its radius) and an icy mantle. Callisto, in contrast, is only weakly differentiated. Ganymede has a magnetic field with about 1% the strength of the Earth's; it could be generated either in the core or in a salty ocean within the ice layer. Spectroscopic studies show that Ganymede's surface is dominantly water-ice, with scattered patches of carbon dioxide ice, and that the darkening is caused by silicate minerals (probably in the form of clay particles) and tarry molecules called tholins. There are also traces of oxygen and ozone, apparently trapped within the ice, and an extremely tenuous (and continually leaking) atmosphere of hydrogen, which is presumably the counterpart to the oxygen produced by the breakdown of water molecules. There are two distinct terrain types on Ganymede, one darker than the other. It is apparent that the pale terrain (which commonly consists of multiple sets of grooves) must be younger than the dark terrain, because belts of pale terrain can be seen to cut across pre-existing tracts of dark terrain. However, the density of impact craters on both terrain types shows that each must be very old, perhaps as much as 3 billion years. Gaspra En route to Jupiter the Galileo spacecraft made a flyby of asteroid (951) Gaspra in 1991, revealing it to be an irregular-shaped, heavily cratered body. Gaspra lies in the main belt. Gaspra En route to Jupiter, the Galileo spacecraft made a flyby of asteroid (951) Gaspra in 1991, revealing it to be an irregular-shaped, heavily cratered body. Gaspra lies in the main belt. gardening Process whereby impacts of small METEOROIDS cause turnover of the outer few metres of lunar REGOLITH in geologically short timescales, of the order of tens of millions of years. Garnet Star Name given by William HERSCHEL to the star j Cephei on account of its strong red colour. It is a red supergiant, spectral type M2 Ia, and a semiregular variable (subtype SRC), ranging between about mags. 3.5 and 5.1 every 2 years or so. It lies about 2800 l.y. away. Gascoigne, William (1612-14) English inventor of the micrometer, apparently self-taught in astronomy. Like his associates Jeremiah HORROCKS and William CRABTREE he seems to have been a Copernican. Gascoigne was the first to solve the problem of how to insert a cross-hair into the focus of a Keplerian refracting telescope so that it could be used as a sighting instrument. Around the same time (c.1640), he invented the eyepiece micrometer, in which a precision screw was used to move two pointers in the telescope's field of view. By enclosing the body being observed between these pointers, its angular diameter could be measured to within a few arcseconds from a knowledge of the focal length of the object glass and the pitch of the micrometer screw. Such precision measurements were crucial in quantifying changes in the lunar and solar diameters, and correlating them with Kepler's elliptical orbits, to match theory with physical evidence. gas giant Collective term used to describe JUPITER, SATURN, URANUS and NEPTUNE, also described as the jovian planets'. These planets have thick opaque atmospheres and no solid surface visible. They are thought to contain a small solid core, with the majority of their mass made up of gas. Because of this the planets' densities are low, indeed that of Saturn is less than that of water. Uranus apart, the gas giants emit more radiation than they receive from the Sun, implying an internal heat source due in part to the effects of rotation and gravity. Saturn has long been known to have a ring system. Very much fainter ring systems have been found around the other planets since 1977. The term gas giant is also used descriptively for larger planets with similar characteristics thought to orbit around other star systems. Gaspra Inner MAIN-BELT ASTEROID and member of the FLORA family; number 951. Gaspra was encountered by the GALILEO spacecraft in 1991 October while en route to Jupiter; it was the first asteroid to be examined in this way. Gaspra is angular and thus non-spherical in shape, measuring about 18 X 11 X 9 km (11 X 7 X 6 mi). It is peppered with small craters but lacks medium to large craters, suggesting that its surface is relatively young (much younger than the Solar System). This view is supported by its planar surfaces, which may indicate where portions of the original body were sheared off by one or more major collisions some billions of years ago. Crustal cracks similar to those seen on PHOBOS are also apparent. It is believed that Gaspra is one of the daughter products of the inter-asteroid collision that produced Flora and the other members of its HIRAYAMA FAMILY. Gaspra's spectral reflectance indicates it to be an S-class asteroid, similar in gross composition to IDA, the other asteroid examined during flyby from Galileo. Images show significant colour variations over Gaspra's surface, with some craters and ridge tops - where the REGOLITH might be expected to be thinner or absent -appearing bluer than the surrounding areas. This variation may indicate that long term space weathering, through exposure to micrometeoroid impacts, is the cause of the redness of the surface, with the solid body of Gaspra beneath being less red. Gassendi, Pierre (1592-1655) French mathematician and astronomer. In 1631 he used the eyepiece projection method with a Galilean telescope to safely make the first observation of a transit of MERCURY across the Sun. Johannes KEPLER, with whom Gassendi corresponded, had predicted this transit would take place, using his then-newly conceived theories of planetary motion. Gassendi Lunar crater (18°S 40°W), 89 km (55 mi) in diameter, with rim components up to 2700 m (9000 ft) above its floor. Gassendi has numerous rilles. Its central peaks formed from rebound of the floor after impact. Gassendi's rim is uneven, dipping in its southern region to the point where lavas have flowed through gaps to enter the crater's interior. Gauss, Carl Friedrich (1777-1855) German mathematician and physicist who made major contributions to celestial mechanics. He made a comprehensive study of methods of determining the orbits of planets and comets, taking into account the effects of gravitational perturbations. He then studied the theory of errors of observation, which led him to develop a technique known as the method of least squares for estimating true values from observations subject to error. In 1801 Gauss used his least-squares method successfully to reconstruct the orbit of the first asteroid, CERES, discovered by Giuseppe PIAZZI but subsequently lost. Piazzi obtained only three positions for Ceres, covering only a tiny 9° arc of its orbit. Gauss sent his predictions for the future positions of Ceres to Franz von ZACH, who was able to recover the asteroid on 1801 December 7. Gauss' method of computing minor perturbations to planetary orbits was later employed by Urbain LE VERRIER and John Couch ADAMS in their computations of the orbit of Neptune. Geller, Margaret Joan (1947- ) American astrophysicist who, working with John huchra at the Harvard-Smithsonian Center for Astrophysics (CfA), has made groundbreaking surveys of galaxy redshifts to map the large-scale structure of the Universe. 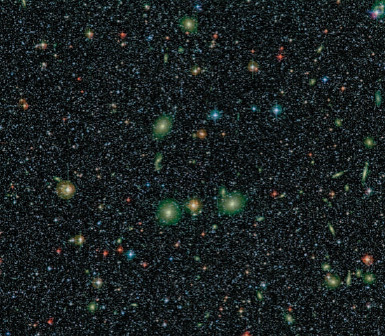 The CfA Redshift Survey mapped the distribution of over 18,000 galaxies in three dimensions. The most famous map constructed by Geller's team, which looked something like a 'stick-man' figure, disclosed the structure known as the great wall (1989). Geller was only the second woman to be awarded a doctorate by Princeton University. Geminga One of the most powerful gamma-ray objects in the sky, around 500 l.y. (160 pc) from Earth. It has a period of 0.237 second, so it is most likely a short-wavelength equivalent of a pulsar, and thus the closest pulsar to Earth. No radio waves have been detected from Geminga, so it is assumed that the jets are not pointed at Earth. The name Geminga comes from Gemini gamma-ray source, since the object is in the constellation Gemini, and its Italian discoverers thought it a good name since 'geminga' in the Milanese dialect means 'it does not exist'. Geminids Most consistently active of the annual meteor showers, occurring between December 7 and 16. At peak, the radiant lies just north of Castor, and the shower produces zenithal hourly rates (ZHR) as high as 120. The Geminids have been observed since 1838 and have become gradually more active over the years. In the 1970s, the peak was narrow with ZHR around 70; returns in the late 1990s, however, showed a much higher and broader maximum. The changing activity pattern is consistent with computer models of the meteor stream, the orbit of which is being pulled closer to that of the Earth by gravitational perturbations. The models suggest that peak activity will become progressively later during the 21st century and will eventually begin to diminish in intensity. At present, the rise to maximum is gradual, with a more rapid decline. Geminid meteors are relatively slow, with a velocity of 35 km/s (22 mi/s). A detailed analysis by G.H. Spalding (Didcot, UK) showed evidence for particle sorting in the stream, with bright events - produced by larger mete-oroids - being more numerous after Geminid maximum. Geminid meteoroids have long been known to have a higher density (2 g/cm3) than those from other (cometary) sources, and they survive ablation down to lower altitudes in Earth's atmosphere. This can be accounted for by their origin from asteroid (3200) phaethon, discovered in 1983. Asteroid and meteor stream have an unusual orbit, with a very small perihelion distance of 0.14 AU. Gemini Observatory Major international facility consisting of two identical 8.1-m (27-ft) optical/infrared instruments, the Gemini Telescopes, one at mauna kea observatory (Gemini North), dedicated in 1999 June, and the other on the 2715-m (8910-ft) high ridge of Cerro Pachon in the Chilean Andes (Gemini South), which became operational in 2002 January. The seven partner countries supporting the Gemini Observatory are the USA, UK, Canada, Australia, Argentina, Brazil and Chile. Gemini Observatory This infrared view of a star-forming region in the Milky Way was taken using the Gemini North telescope on Mauna Kea. Adaptive optics helped sharpen the image. Prominent northern zodiacal constellation, representing Castor and Pollux, the mythological twin sons of Queen Leda of Sparta; their brotherly love was rewarded by a place among the stars, between Auriga and Canis Minor. castor is a remarkable sextuple system, consisting of a pair of bluish-white stars, mags. 1.9 and 3.0, separation 3".1, period about 467 years, both of which are spectroscopic binaries, and an eclipsing binary, YY Gem (range 8.9-9.6, period 0.81 day). r Gem is one of the brightest cepheid variables (range 3.6—1.2, period 10.15 days). 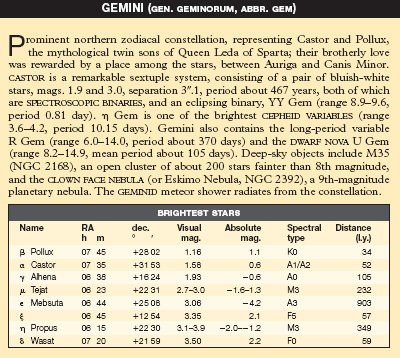 Gemini also contains the long-period variable R Gem (range 6.0-14.0, period about 370 days) and the dwarf nova U Gem (range 8.2-14.9, mean period about 105 days). Deep-sky objects include M35 (NGC 2168), an open cluster of about 200 stars fainter than 8th magnitude, and the clown face nebula (or Eskimo Nebula, NGC 2392), a 9th-magnitude planetary nebula. The geminid meteor shower radiates from the constellation. The two telescopes employ new-technology thin mirrors with active optics to provide stable images under all conditions of telescope attitude and wind loading. They also use state-of-the-art adaptive optics to compensate for atmospheric turbulence, yielding images of very high resolution. These are analysed with a comprehensive suite of optical and infrared instruments. The telescopes are particularly suited to research on star formation within dust clouds and studies of the very distant Universe. As well as the telescope facilities, the observatory has a project office in Tucson, Arizona, and sea-level operations centres at Hilo, Hawaii and La Serena, 400 km (250 mi) north of Santiago in Chile. The Gemini Observatory is managed jointly by the association of universities for research in astronomy and the National Science Foundation. Gemini Project Series of 12 US spacecraft launched by Titan II rockets between 1964 and 1966. Gemini 3-12 carried two-man crews and played a vital role in preparations for the Apollo missions to the Moon. Experiments included orbital rendezvous, docking and EVA (extra-vehicular activity). The longest mission (Gemini 7) lasted for 330h 35m 17s. Gemini Telescopes see gemini observatory Geminus Lunar crater (35°N 57°E), 90 km (56 mi) in diameter, with a western rim rising to 4880 m (16,000 ft) above its floor. Geminus is a complex crater, with central peaks and wall terracing. The crater appears oblong due to foreshortening but is actually more nearly round. Micrometeorite erosion has removed its bright rays, though its EJECTA are still visible. Gemma Alternative name for the star a Coronae Borealis. General Catalogue of Variable Stars (GCVS) Principal listing of stars discovered to be variable, compiled by Pavel Nikolaevich Kholopov (1922-88) and others. The first edition appeared in 1948; the 5th edition of 1998 contains 28,484 variables. The catalogue is produced at the Sternberg Astronomical Institute, Moscow, where an updated electronic version is maintained. general relativity New theory of gravity derived by Albert EINSTEIN in 1916 that generalized his already successful special theory of relativity to include accelerations and gravity. The fundamental postulates of this new theory are: (i) SPACETIME is a four-dimensional CONTINUUM; and (ii) the PRINCIPLE OF EQUIVALENCE of gravitational and inertial mass. The basis of his theory suggests that mass-energy distorts the fabric of spacetime in a very predictable way, and the altered paths of particles in this warped spacetime are deflected as if a force were exerted on them. Einstein needed a type of mathematics called differential geometry in order to express the relationship between mass-energy and curvature. His FIELD EQUATIONS describe the curvature produced in spacetime by a gravitational source. Some of the consequences of general relativity are that in strong gravity time slows down, light paths are altered by gravity, and gravity in strong gravitational fields no longer obeys Newton's inverse square law. These effects are minor for most planetary orbits, but were measurable even in Einstein's time for the orbit of Mercury. General relativity has opened up new fields of astronomy such as the study of black holes, gravitational waves and cosmology. Unlike SPECIAL RELATIVITY, which is universally accepted by physicists, many were dubious of the application of differential geometry and awaited observational confirmation of this new gravitational theory. Sir Arthur EDDINGTON was the first to measure the effects of gravity on light from distant stars during a total solar eclipse. Since then, many tests have been done and general relativity has passed every one of them. In spite of general relativity's success, there are several competing theories of gravity that make similar but not identical predictions as Einstein's. The major problem with general relativity is it is a continuum theory and to date it has resisted quantization. A merger of the quantum theory and general relativity predicts on length scales of 10~43 m (the quantum realm), relativity fails. Although some assign a classical particle called a graviton to general relativity, it is not compatible with current elementary particle physics. Genesis NASA Discovery-class mission to collect samples of the SOLAR WIND and return them to Earth for analysis. Genesis was launched in 2001 June and is stationed at the L1 LAGRANGIAN POINT between the Earth and Sun. It will collect samples for two years and return a capsule with the solar material to Earth in 2004 June. Genesis rock Lunar rock that is notable for its high content of the mineral plagioclase; it was collected on the Apollo 15 mission. Rocks with this mineral composition are called ferroan anorthosites; they represent the mineral composition of the Moon's early crust. gegenschein (Ger. counterglow) Faint and diffuse patch of light seen opposite the Sun in the night sky under the most transparent, moonless conditions. The gegenschein is slightly oval in shape, with its long axis extending along the ecliptic, and has a diameter of about 10°. In brightness, the gegenschein is comparable to the fainter parts of the Milky Way, and it is best seen when high in the sky. The best viewing times in the northern hemisphere are in December and January, while in the southern hemisphere the gegenschein is best seen in August (being masked by the brightness of the Milky Way, against which it then lies, in June and July). The gegenschein results from the scattering of sunlight by tiny dust particles in interplanetary space. Pho-topolarimetric measurements from the Pioneer and Voyager spacecraft indicate that the gegenschein is essentially absent beyond the orbit of Jupiter. The reflective material belongs to the zodiacal dust complex. Under very clear, dark conditions, the gegenschein can be seen to be connected to the rather brighter ZODIACAL LIGHT by narrow faint extensions, known as ZODIACAL BANDS, along the ecliptic. geocentric theory Model of the Universe in which a stationary Earth takes central place, the world-view of many early civilizations. The Sun, Moon and planets were regarded as revolving around the Earth. By the 5th century BC, the Greeks were aware that the apparent motion of the Sun could be represented as the net result of a daily rotation around the Earth and a yearly journey along the ecliptic, the two motions being inclined to each other by about 24°. All motions were believed to proceed at uniform rates along perfectly uniform circles. The first theory of planetary motion was put forward by EUDOXUS, who proposed a system of 26 revolving 'homo-centric' (Earth-centred) spheres which carried the Sun, Moon and planets through space. 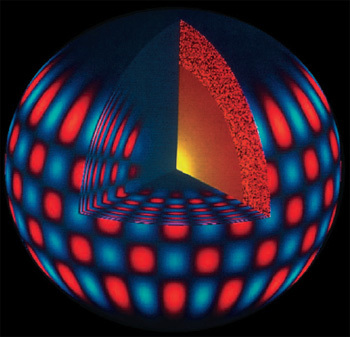 By invoking contorted arrangements for the rotational axes of these spheres, many of the observed phenomena, including retrograde motions, could be reproduced. Further complexity was introduced when ARISTOTLE added even more spheres. Because the spheres are not visible, yet had to be capable of supporting the planets, they were regarded as 'crystalline' - invisible, or glass-like. It was Aristotle's model, as modified by Ptolemy, that survived until the end of the Renaissance and that was defended so vigorously by the Catholic Church, largely thanks to his theory of motion, which was the nearest and most coherent approach to physics before the age of Galileo Galilei and Isaac Newton. In an alternative geocentric model proposed by APOLLO-NIUS around 200 BC, the Earth remains at rest in the centre of the Universe, but the Moon, Sun and planets move in circular motion about centres displaced from the Earth. This allows to some extent for the non-uniformity of planetary motion. Apollonius showed that these 'displaced' circular orbits can just as well be described in terms of motion on a circle (the epicycle) whose centre itself moves on a larger circle (the deferent), centred on the Earth. Geocentric theory reached its highest development in the work of Ptolemy (see ptolemaic system), which held sway for about 1500 years. Nicholas Copernicus' heliocentric theory (see copernican system) did not immediately dislodge it; that came only with the improved observations of Tycho Brahe, as systematized by Johannes Kepler and formed into a consistent heliocentric theory by Newton, and the telescopic discoveries of Galileo. geochemistry Division of chemistry concerned with the abundances of elements and their distribution within planetary bodies. The most primitive, least altered meteorites are composed of minerals that contain the non-volatile elements (excluding hydrogen, helium and the noble gases) in relative proportions very similar to their abundances in the Sun, as deduced from spectroscopy. Larger bodies that formed from such material were altered to various degrees by heating and differentiation. The most abundant elements separated into metallic core and silicate mantle and crust. The less abundant elements were partitioned among them according to their chemical and thermodynamic properties. The elements classified as siderophile, lithophile or chalcophile have affinities for metallic iron, silicates and sulphides, respectively. Chemical analysis of one component of a planetary body can provide information about the rest; for example, a sample of the body's crust can reveal much about the composition of its core. Moreover, some elements have affinities that vary with temperature, pressure and the oxidizing/reducing conditions of their surroundings; the distribution of these elements among various mineral phases in a rock reveals the conditions of its formation. A closely related discipline is cosmochemistry, which includes the behaviour of elements in interstellar space and the solar nebula. geodesic Shortest distance between two points, given by a straight line on a flat surface and by a great circle on a sphere. In general relativistic curved spacetime, a geodesic is the path giving smallest separation between two events (see time). The orbital motion of planets and other astronomical objects is then understood as the objects following geodesic tracks through a spacetime that has been distorted from Euclidean geometry by the presence of masses. geodesic The orbital motion of a small body past a more massive one can be understood in terms of distortions in spacetime. The more massive body (centre) lies at the bottom of a ‘well’, through which the smaller body will pass on the arrowed trajectory. geomagnetic storm Large-scale disturbance of Earth's magnetosphere resulting from the arrival via the solar wind of energetic, highly magnetized plasma thrown from the Sun during coronal mass ejection or flare events. The most visible effects of a geomagnetic storm take the form of enhanced auroral activity, including the spread of the aurora to lower latitudes than normal. Magnetometer equipment allows detection of other effects, which can, during severe storms, be global in extent. The onset of a geomagnetic storm, as ejected solar material impacts on the magnetosphere, is detected by magnetometers as a sudden storm commencement (SSC). During the SSC, compression of the magnetosphere produces an abrupt intensification of the ground-level magnetic field, the horizontal east-west component of which shows a rapid change in orientation. During the main phase of the storm, which can last for 24-36 hours, the magnetic field continues to fluctuate rapidly before gradually returning to normal. The fluctuations can be correlated with episodes of increased auroral activity. They result from the build-up and release of stress produced as plasma from the solar wind penetrates the magnetosphere, disturbing the resident population. Ground-level electrical currents induced by geomagnetic storms have in the past disrupted telegraph communications, and they can cause corrosion in high-latitude oil and gas pipelines. During the huge storm of 1989 March 13-14, these currents caused a power blackout affecting Quebec Province in Canada. Ionospheric currents pose a hazard to artificial satellites, leading to a build-up of charge which can damage electrical components. Satellites that have been lost following geomagnetic storms include Marecs-B (used in navigation), Anik-1 and Anik-2 (telecommunications) and ASCA (astronomical research). Georgian planet Obsolete name for uranus, originally suggested by William herschel, who discovered the planet in 1781, in honour of his patron King George III. The name was in use in the Nautical Almanac until 1850.
geostationary orbit See geosynchronous orbit geosynchronous orbit Orbit in which a satellite completes one revolution around the Earth in the same time as the Earth's sidereal rotation period of 23h 56m 4s. If this orbit is circular and in the plane of the Earth's equator (that is, with an inclination of 0°), the satellite appears to be virtually stationary in the sky, so it is described as geostationary. A geostationary orbit is at an altitude of 35,900 km (22,380 mi) above the Earth. A satellite in a geosynchronous orbit inclined to the Earth's equator appears to trace out a figure-of-eight shape over the course of a day. Geotail Japanese satellite launched in 1992 as part of the international solar terrestrial physics programme, involving the US wind and polar spacecraft and the European soho and cluster satellites. Geotail measures global energy flow and transformation in the Earth's magnetotail to increase understanding of the processes in the magnetosphere. The craft used two gravity assist flybys of the Moon to enable it to explore the distant part of the magnetotail. Two years later, the orbit was reduced so that the spacecraft would study the near-Earth magnetotail processes. German mounting Type of equatorial mounting used for telescopes. ghost crater Crater that was flooded with lava such that its ejecta, floor and rim were completely covered. Because lava above the crater's rim remained relatively thin, the later subsidence of the lava placed stress over the rim. This stress is expressed as a mare ridge over the rim; the ridge is circular, hence the appearance of a 'ghost crater'. 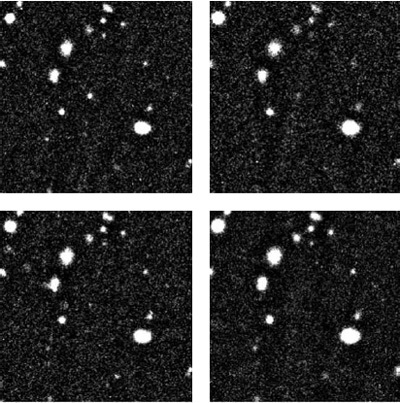 ghosting Production of one or more faint, displaced secondary images - ghost images - in an optical system caused by unwanted internal reflections. Ghosting can also be caused by an imperfect diffraction grating, causing spurious spectral lines. Giacobini-Zinner, Comet This comet was imaged on 1998 November 1 by the Kitt Peak 0.9 m (36 in.) telescope. The teardrop-shaped coma shows strong bluish CO emission. 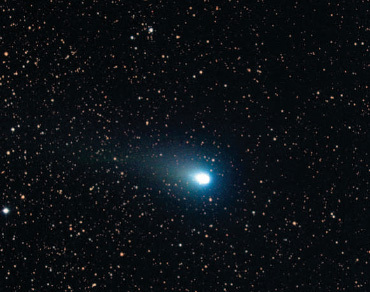 Giacobini–Zinner, Comet This comet was imaged on 1998 November 1 by the Kitt Peak 0.9 m (36 in.) telescope. The teardropshaped coma shows strong bluish CO emission. Ghost of Jupiter (NGC 3242) planetary nebula in the constellation Hydra, a couple of degrees south of li (RA 10h 24m.8 dec. -18°38'). The object has an apparent diameter of 16", and a pronounced blue-green colour. It takes its name from dark bands seen within its disk, giving it a resemblance to the planet Jupiter. NGC 3242 has overall mag. +7.8, with a central star of mag. + 11.4. It lies 1400 l.y. away. Giacconi, Riccardo (1931-) Italian-American physicist who pioneered x-ray astronomy. In the late 1950s, Giacconi designed and built the first grazing-incidence X-ray telescopes, which were flown on rockets above the Earth's atmosphere. In 1962 his group used these detectors to discover Scorpius X-1, the first powerful X-ray source found outside the Solar System. Giacconi and colleagues designed and built the uhuru X-ray satellite, which made the first comprehensive survey of X-ray sources, and the einstein observatory, which made the first highly detailed contour maps of individual X-ray sources. Giacobinids (Draconids) Periodic meteor shower associated with Comet 21P/giacobini-zinner. Showers of Giacobinids have been seen only in those years when the parent comet has returned, and they have durations of a few hours. Possible low activity was seen in 1915 and 1926, with substantial displays on 1933 October 9 and 1946 October 10. During a 4 -hour period, the 1933 return produced Giacobinid rates of between 50 and 450 per hour. In 1946, despite strong moonlight, visual rates of about 5000 Giacobinids per hour were reported; this display was also observed using radio echo methods at Jodrell Bank. Japanese observers recorded another significant outburst on 1985 October 8. Until 1998 reported Giacobinid displays had occurred when Earth followed the comet to the node where its orbit intersects that of the Earth; the strong display of 1998 October 8, however, with Giacobinid rates reaching 50-100 per hour, was somewhat surprising because, on this occasion, Earth crossed the node 44 days ahead of the comet, which indicated a greater spread of meteoroids in the space around the nucleus than had previously been suspected. Giacobinid meteors come from a radiant near the 'head' of Draco; they are notably slow, with an atmospheric velocity of only 20 km/s (12 mi/s). Giacobini-Zinner, Comet 21P/ Short-period comet discovered by Michel Giacobini (1873-1938), Nice Observatory, France, on 1900 December 20, and rediscovered two returns later on 1913 October 13 by Ernst Zinner (1886-1970) at Remeis, Germany. The comet's period is 6.61 years, with favourable apparitions at every second return. Comet 21P/Giacobini-Zinner has been observed at 15 returns up to 1998, with only the 1953 apparition having been missed. The comet is the parent of the giacobinid meteors. Comet 21P/Giacobini-Zinner became the first comet to be investigated at close range by a spacecraft: the International Comet Explorer (ICE) flew through its tail on 1985 September 11.
giant impactor theory Theory that addresses the origin of the moon. Prior to the Apollo missions, there were three 'classical theories' of lunar formation. First, the fission hypothesis, in which the Moon was 'spun out' from a rapidly rotating, but still molten, Earth. Secondly, the binary accretion hypothesis, in which the Earth and Moon formed as a 'double planet', and so remained rotating around each other. The problem with this notion is that it should produce two bodies with the same composition, which is not the case. Thirdly, the capture hypothesis whereby the Moon was formed elsewhere in the Solar System and then captured by Earth's gravity. The Moon is, however, so large that, with any significant difference in approach velocity, the Earth would be unable to capture it unless a highly improbable set of orbital coincidences were satisfied. After the Apollo missions returned samples of the lunar surface, the above theories were discounted. In the 1970s, a new mechanism of lunar formation was proposed - the giant impactor theory. In this scenario, the Earth was struck on its side by a Mars-sized planetesi-mal. This glancing blow propelled large amounts of Earth's mantle and of the impactor into orbit. The impactor's core later decelerated and returned to Earth, but the rest of the material remained in orbit, forming a transient ring. This material rapidly accumulated by impact processes into the Moon. The giant impactor theory offers an explanation for the Moon's unique mineral composition. The Moon is depleted in iron because the Earth had already partially differentiated (the iron was in the core), and so little iron was in the mantle's ejecta. The high temperatures of the impact process explain the Moon's depletion in volatiles (such as potassium and water) and its enrichment in refractory elements (such as europium). The Moon has the same isotopic compositions as Earth because much of it came from the Earth's mantle. The giant impactor theory also explains the angular momentum of the Earth-Moon system by proposing a glancing blow. Finally, the accumulation of orbital materials into the Moon by high temperature impact processes offers an explanation for the early Moon's near global melting (producing a global magma ocean, which accounts for the mineralogi-cal stratification of the Moon). Giant Metre-wave Radio Telescope (GMRT) Major facility operated by the National Centre for Radio Astrophysics at Pune, India. The GMRT consists of 30 fully steerable 45-m (150-ft) antennae spread over distances of up to 25 km (16 mi) and located about 80 km (50 mi) north of Pune. giant molecular cloud (GMC) molecular cloud with a mass that exceeds 10,000 solar masses. About half of all the interstellar matter in the Galaxy is in the form of GMCs. Numerous complex molecules are found inside the clouds (see interstellar molecules) and some of these form naturally occurring masers. The larger GMCs are gravitationally bound and in most of them parts of the cloud are collapsing to form new stars. The orion nebula is such a star-forming region within the nearest GMC to Earth. The formation of stars, especially the luminous massive ones, eventually heats up the GMC and the stars' ultraviolet radiation dissociates the molecules. GMC lifetimes are thus only around a few tens of millions of years. giant planet Term used to describe the planets jupiter, saturn, uranus and neptune to distinguish them from the smaller, less massive rocky terrestrial planets of the Solar System. They are also known as the Jovian planets or gas giants. Giant Segmented-Mirror Telescope (GSMT) Project of the New Initiatives Office of the association of universities for research in astronomy for a 30-m (100-ft) ground-based optical telescope (formerly known as MAXAT) to be commenced by 2010. The GSMT is intended to complement the atacama large millimeter array and the next-generation space telescope. giant star Star with radius between 10 and 100 solar radii; it is placed well above the main sequence in the hertzsprung-russell diagram. Giant stars include arcturus, capella and aldebaran. A giant star will have a larger radius than a main-sequence star (dwarf star) of the same temperature; however, a giant star of intermediate temperature is smaller in size than the hottest dwarf. Thus the term 'giant' refers to the relative luminosity of a star rather than its size. Giant stars represent late stages in stellar evolution, when the stars have exhausted hydrogen in their cores and shell burning is occurring. They have dense central cores and tenuous atmospheres. red giants are normal stars that are undergoing hydrogen shell burning. Higher-mass stars can continue to burn other elements in their cores and in concentric shells in their atmosphere. As the mechanism that creates energy within a star switches from one set of nuclear reactions to another, its radius, temperature and luminosity change. Thus giant stars move around the giant region and horizontal branch of the Hertzsprung-Russell diagram. Most stars pass through the instability strip at some point, becoming cepheid variables or rr lyrae variables. In its final phase, a giant star becomes brighter and moves to the asymptotic giant branch. Because of their high intrinsic luminosity, giants are quite common among naked-eye stars but are in fact relatively rare in space. gibbous phase Phase of a planet or the Moon when between first or last quarter and full. The word gibbous means 'bounded by convex curves' and describes the appearance of a body when more than half but less than all of its illuminated side is visible. Gilbert, William (1540/44-1603) English doctor, the first scientist carefully to investigate magnetic phenomena, including the Earth's magnetic field, as described in his De magnete ('On Magnetism', 1600). He believed the planets were held in their orbits by magnetic attraction. Gilbert was one of the first English supporters of Copernicus' ideas, and he prepared a pre-telescopic Moon map. Comet of 1882 showed so many stars that he proposed photography as the best method of acquiring data for star catalogues. In collaboration with the Dutch astronomer Jacobus kapteyn, who compiled data from Gill's photographic plates, he produced the massive cape photographic durchmusterung, which lists the positions and magnitudes of 455,000 stars in the southern hemisphere brighter than 10th magnitude. Gill was one of the major forces behind the all-sky photographic survey known as the carte du ciel. Giotto european space agency's first deep-space probe and the first spacecraft to make close-range studies of two comets. It was named after the Italian painter Giotto di Bondone (c.1267-1337), who depicted Halley's Comet as the 'Star of Bethlehem'. Giotto carried ten experiments to study all aspects of the comet and its environment. It was launched from French Guiana on 1985 July 2 by an ariane 1 rocket and encountered Comet halley on 1986 March 14. Giotto was peppered by 12,000 dust impacts on its approach to the nucleus. Only 15 seconds before closest approach, the spacecraft was sent spinning by an impact with a large particle. Contact was eventually restored 32 minutes later, by which time Giotto had passed the nucleus on the sunward side at a distance of 596 km (370 mi). Giotto's images revealed a black nucleus about 15 km (9 mi) long and 7-10 km (4-6 mi) wide. It was pockmarked by craters, and bright jets of material could be seen on the sunlit side. About 80% of this material was water, with substantial amounts of carbon monoxide (10%), carbon dioxide (2.5%), methane and ammonia. The density of the nucleus was 0.3 g/cm3 (one-third the density of water). Although the spacecraft and half of its experiments were damaged, Giotto completed the first Earth gravity assist by a spacecraft coming from deep space on 1990 July 2. It was then retargeted to encounter Comet grigg-skjellerup on 1992 July 10. During the closest ever cometary flyby, Giotto passed by on the night side at a distance of about 200 km (125 mi). Dust caused very little damage to the spacecraft, owing to its slow relative approach speed of 14 km/s (9 mi/s), compared with 68 km/s (109 mph) for Halley, and a much lower dust production rate. The experiments were shut down on July 11. Glenn, John Herschel (1921- ) First American to orbit the Earth, in the Mercury spacecraft named Friendship 7, on 1962 February 20. After distinguished careers as a World War II combat pilot and a test pilot, Glenn was selected as one of the seven original Mercury astronauts in 1959, and less than three years later he completed his three orbits of the Earth in 5 hours. On 1998 October 29, Glenn returned to space for nine days aboard the Space Shuttle Discovery, becoming the oldest astronaut in history. Research Center at Lewis Field, a national aeronautics and space administration (NASA) laboratory specializing in propulsion, power and communications technologies, situated next to Hopkins International Airport, Cleveland, Ohio. It was founded in 1941 as the Aircraft Engine Research Laboratory, and was later known as the Lewis Research Center. It is NASA's lead centre for aeropropulsion and its centre of excellence in turbomachinery. It also conducts research in microgravity, fluid physics and materials science. glitch Sudden increase in the rotation rate observed in a number of younger pulsars, such as the Crab and Vela pulsars. The largest glitches have been seen in the Vela Pulsar; they occur every few years and typically decrease the period by a few millionths of the period. The glitch relaxes on a timescale of a few days. It is believed that glitches are caused by sudden changes in the internal structure of the NEUTRON STAR, for example by quakes in the solid components, such as the crust, or by vortices (whirlpools) in the superfluid layers. These vortices move outwards, but because they are pinned at the top and bottom they are not able to move outwards freely; they move jerkily when the pinning breaks. Global Oscillation Network Group (GONG) Group that studies the structure and dynamics of the SOLAR INTERIOR using HELIOSEISMOLOGY. Six solar telescopes around the Earth obtain nearly continuous observations of the solar oscillations. The sites in the GONG network are the Big Bear Solar Observatory, the Learmonth Solar Observatory, the Udaipur Solar Observatory, the Observatorio del Teide, the Cerro Tololo Interamerican Observatory and the Mauna Loa Observatory. Global Oscillation Network Group (GONG) A computer representation of one of the almost 10 million modes of sound wave oscillation in the Sun, as monitored by helioseismologists working under the umbrella of GONG. Solar regions that are receding are shown in red, those that are approaching in blue. Global Positioning System (GPS) Navigation satellite system, operated by the US Air Force but also widely used by civilians, that enables users equipped with GPS receivers accurately to locate their positions on the Earth's surface. The system comprises 24 satellites, the first of which was launched in 1978.
globular cluster Almost spherical, compact, gravitationally bound cluster of stars, containing around ten thousand to a million members. The core of a globular cluster is very densely packed and cannot generally be resolved into individual member stars. Globulars range in diameter from a few tens to over 300 l.y. globular cluster Containing at least 300,000 ancient stars, the globular cluster G1 orbits the Andromeda Galaxy. This Hubble Space Telescope image shows G1 to have a rich, compact core and less densely packed periphery. The Milky Way has fewer than 150 known globular clusters, but it is expected that there are about 200 in total, the others being obscured by the dust and gas in the galactic plane and the galactic centre. The farthest known globular clusters, for example NGC 2419, lie beyond the galactic disk at distances of around 300,000 l.y. Most globular clusters in the Milky Way lie in the galactic HALO, surrounding the galactic centre; they have highly elliptical orbits of periods about a hundred million years or longer. The fact that they are centred on the galactic centre allowed the American astronomer Harlow SHAPLEY to estimate the distance to the galactic centre. Around 20% of globulars lie in the galactic disk and move in more circular orbits; these are known as disk globulars. Globular clusters contain a mix of stars of various sizes, all of which evolved from the same cloud of gas at the same time. As all the stars within a cluster lie at the same distance from us, the HERTZSPRUNG—RUSSELL DIAGRAM (HR diagram) can be plotted for them simply by measuring their colour and their APPARENT MAGNITUDE (brightness), knowing that there is a constant difference between the apparent and the ABSOLUTE MAGNITUDE according to the cluster's distance. It is possible to deduce the cluster's distance by comparison with a standard HR diagram because the MAIN SEQUENCE will appear in the correct place only if the distance is right. The HR diagram of a globular cluster reveals more than its distance. As time passes, the brightest stars in a cluster exhaust their hydrogen and become RED GIANTS. This happens progressively to fainter and fainter stars. The HR diagram clearly shows which stars have begun their transformation to red giants, and thus the age of the cluster. Many globular clusters have been dated about 10 billion years old; they must have formed before the Universe attained half its present age (see TURNOFF POINT). In those remote times the chemical mix of our Galaxy was quite distinct from that of the present. Stars, especially those that turn into SUPERNOVAE, create elements such as carbon, oxygen, silicon and iron out of their hydrogen. Over the years, the proportion of these elements, which astronomers call metals, has increased, so we expect to see more metals in young stars than in the old globular clusters. 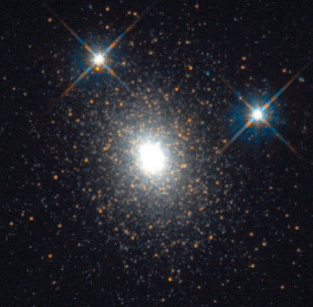 In general, the stars within globular clusters are old, metal-poor, POPULATION II stars. Further detailed examination of galactic globular clusters suggests distinct subgroups: the halo globulars, further divided into 'old halo' and 'young halo' clusters; the disk globulars, which are younger and more metal-rich than halo globulars; and the bulge globulars, which lie in the more central parts of the Galaxy and are fairly metal-rich, with almost solar-type chemical abundances. The oldest globular clusters probably formed 13 to 14 billion years ago in the initial collapse of the forming Galaxy. The younger, more metal-rich disk globulars and the bulge globulars formed significantly later. The young halo globulars, such as M54, may have formed outside the Galaxy, perhaps in nearby DWARF GALAXIES, which were subsequently pulled into the Milky Way. M54 is believed to have belonged to the Sagittarius Dwarf Galaxy, discovered in 1994, which is currently merging with the Milky Way. Another important role of the globular clusters has been to give us a means of estimating distances. Globular clusters contain a particular type of variable, the RR LYRAE STARS, the intrinsic brightnesses of which can be determined. Thus, when these stars are recognized in other locations, the distances can be derived for different objects. Globular clusters can be seen around other galaxies. Some galaxies, such as M87, contain several thousand globular clusters, whereas other galaxies, like the two Magellanic Clouds and the Pinwheel Galaxy, appear to have globulars that are only a few billion years old. Recent observations of some globulars suggest star formation may be occurring within them. globule Dense compact dust and gas cloud that strongly absorbs the light from objects behind it. A globule is the smallest of the DARK NEBULAE. There are two main types of globule — the COMETARY GLOBULE and the Bok globules. The latter are named after Bart Jan BOK, who first suggested that the globules might be the forerunners of PROTOSTARS. Goddard Space Flight Center national aeronautics and space administration (NASA) major space science laboratory, located in Greenbelt, Maryland, near Washington D.C. Established in 1959 May, it is named in honour of the American rocket pioneer Robert goddard. The centre specializes in astronomy, solar-terrestrial relations, and environmental studies of, for example, the Earth's ozone layer and global warming. Goddard operates its own spacecraft, and conducts research in spaceflight technology. It also houses the National Space Science Data Center and the astronomical data center. Such a large mass of gas and dust within the small radius of a globule at a low temperature will undergo gravitational contraction to form first protostars and then normal main-sequence stars. The close positional association of globules with ttauri stars and herbig—haro objects, both phenomena associated with star formation, tends to confirm this view. gluon Particle exchanged when two quarks interact by the strong force. The strong force is the strongest of the four fundamental forces, and the exchange of gluons between quarks holds nuclear particles such as protons and neutrons together, as well as holding them in atomic nuclei. The gluon is a spin-1 boson. Gold, Thomas (1920— ) Austrian-American cosmologist known for his advocacy of non-mainstream theories, including the steady-state cosmological model. He left Austria for England before Word War II, receiving his education at Cambridge, then moving to Greenwich (1952-56) under Martin ryle. He emigrated to the United States in 1956, working first at Harvard, then at Cornell. With Fred hoyle and Hermann bondi, Gold conceived a theory of cosmology where, though the universe expands, the density of matter is kept constant by the continuous creation of new matter. Gold was the first correctly to explain that pulsars are rotating neutron stars with powerful magnetic fields. Goldberg, Leo (1913-87) American astronomer, an expert on stellar evolution, who specialized in solar astronomy and the study of stellar atmospheres and mass loss. At the University of Michigan's McMath-Hulbert Observatory, he used a variety of imaging techniques to capture the structure and motion of solar flares and prominences. 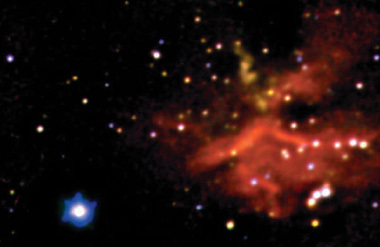 Spending much of his career at Harvard, he designed and helped to build an innovative spectroheliograph that was flown aboard the fourth Orbiting Solar Observatory, launched in 1967.
globule Seen in contrast against bright emission nebulosity, dark globules such as these are probably forerunners of protostars. GMC See giant molecular cloud GMT See Greenwich mean time gnomon Ancient instrument for measuring the altitude of the Sun, consisting of a vertical stick or rod fixed in the ground. The length of the shadow indicates the Sun's altitude, and thus the time of day. The term is also used for the pointer on a sundial. Goddard, Robert Hutchings (1882-1945) American astronautics pioneer, who flew the first liquid-propellant rocket, on 1926 March 16. In 1920 he set forth most of the basic principles of modern rocket propulsion. He later set up a rocket research and development test facility in the New Mexico desert, where he developed stabilizing and guidance systems, including the first rocket gyroscopes, and parachute systems that could be used to recover heavy payloads. Although Goddard's achievements went largely unrecognized during his lifetime, German rocket scientists led by Werner von braun used his designs to build the V-2 rockets that, after their capture at the end of World War II, kick-started the American space programme. Goodricke, John (1764-86) English variable-star observer, born in Groningen, Holland. In 1782, working with his friend Edward Pigott (1753-1825), and using a 3i-inch (95-mm) refracting telescope and a good clock, Goodricke established the 2d 20h 49m 8s periodicity of the star Algol. Goodricke and Pigott went on to propose -correctly, as later astronomers would discover - that Algol's light was being eclipsed by a dimmer body rotating around it. Then in 1784, Goodricke measured the light variation of 8 Cephei and realized that this variation was not the result of an eclipsing body. GO TO telescope Telescope, usually on an ALTAZIMUTH MOUNTING, whose axes are fitted with position encoders that can be directed to find objects by entering simple commands from a handset. On-board computers on GO TO telescopes can store databases of many thousands of objects. Following initial set-up, which usually requires the observer to centre a couple of reference stars in the field of view, the mount will automatically slew the telescope to objects of choice. This greatly eases object location for novice amateur observers, and has also been used to increase the throughput in more advanced PATROLS for supernovae in external galaxies. Gottingen Observatory Scientific facility within the physics faculty of the Georg-August-Universitat at Got-tingen, 90 km (55 mi) south of Hanover. Its origins go back to 1750; construction of the present observatory (just outside the old city walls) began in 1803. Its first director, Carl Friedrich GAUSS, was appointed in 1807, and it became a major centre for astrometry. Its reputation continued into the 20th century under the directorship of Karl SCHWARZSCHILD. Today, the observatory specializes in solar physics, X-ray astrophysics, extragalactic astrophysics and instrumentation for 8-m (25-ft) class optical/infrared telescopes. Gould, Benjamin Apthorp (1824-96) American astronomer who catalogued the southern stars from the CORDOBA OBSERVATORY, Argentina, which he founded and directed (1870-85). He studied astronomy under Carl Friedrich Gauss at Gottingen, and on his return to America he founded the Astronomical Journal in 1849. After directing Dudley Observatory (Albany, New York) from 1856 and his own observatory at Cambridge (Massachusetts), he moved to Cordoba, where he catalogued tens of thousands of stars visible only from the southern hemisphere, publishing several catalogues (1879-96). Gould applied photography to the study of star clusters. GOULD'S BELT is named after him. Gould's Belt Belt of stars and gas about 3000 l.y. across tilted to the galactic plane by about 16°. It contains many O- and B-type stars. Gould's Belt probably represents the local spiral arm of which the Sun is a member. It is named after Benjamin Gould, who identified it in 1879.
graben Structure formed by a pair of inward dipping normal FAULTS. A graben is typically a linear depression in the surface relief. It forms as the result of stretching in the rocks. 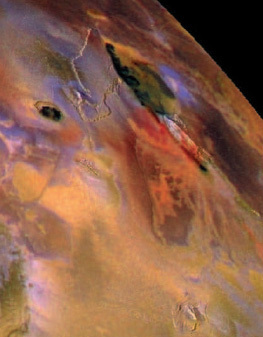 In planetary studies, the presence of grabens, which are easily distinguished on the remote sensing images, indicates an extensional TECTONIC environment at a given location. Grabens are observed on practically all planets and satellites as large as or larger than the Earth's Moon. Graham-Smith, Francis (1923- ) British radio astronomer, the thirteenth ASTRONOMER ROYAL (1982-90), who did pioneering work using Michelson interferometers, helping to develop the phase-switching technique. He helped to confirm the nature of the strong radio sources Cygnus A and Cassiopeia A, and was an integral part of the team that compiled the third Cambridge catalogue (3C) of radio sources in the 1950s. Much of Graham-Smith's research is on pulsars, for which he conceived the relativistic beaming theory. Granat Soviet gamma-ray and X-ray spacecraft launched in 1989 December, carrying a French Sigma gamma-ray instrument, with contributions from Denmark and Bulgaria. With a spacecraft bus based on the Soviet Astron astrophysical platform, Granat had completed, within the first three years, over 700 specific observations lasting typically 24 hours at a time, some as long as 46 hours. Sigma observations in 1991 were coordinated with the newly launched NASA COMPTON GAMMA RAY OBSERVATORY. Grand Tour In the late 1960s, US planners and scientists realized that the four major outer planets -Jupiter, Saturn, Uranus and Neptune - would be in an approximate alignment in the late 1970s/1980s that is repeated only once every two centuries. Ambitious plans were made for two gravity-assist launches to Jupiter/Saturn/Pluto in 1976-77 and similar launches to Jupiter/Uranus/Neptune in 1979, the so-called Grand Tour Missions. Political and economic constraints led to a reduced two-spacecraft mission targeted to only Jupiter and Saturn. Begun in 1972 as Mariner-Jupiter-Saturn (MJS), the project's name was changed in 1977 to VOYAGER. Voyager 2 eventually accomplished a Grand Tour when its mission was extended to Uranus (in 1986) and then Neptune (in 1989). grand unified theory (GUT) Theory that attempts to 'unify' three of the four forces of nature, that is, to demonstrate that they are different manifestations of a single force. In descending order of strength, the four FUNDAMENTAL FORCES are: the strong nuclear interaction (which binds atomic nuclei); the electromagnetic force (which holds atoms together); the weak nuclear interaction (which controls the radioactive decay of atomic nuclei); and gravitation. The weak and strong interactions operate over tiny distances within atomic nuclei while the other two are infinite in range. With the exception, so far, of gravitation, all the forces can be described by quantum field theories, which imply that forces are communicated by means of particles: the more massive the force-carrying particle, the shorter its life and the shorter the range of the force. Grand unified theories (GUTs) attempt to unify the weak, strong and electromagnetic forces. Many physicists believe that a more elaborate theory will eventually be found which will unify all four forces. The first step towards unification was the Weinberg-Salam-Glashow theory of the 'electroweak' force, published in 1967, which implied that at particle energies greater than about 1012 eV, the electromagnetic and weak forces should be equal in strength and behave in the same way. The theory was confirmed in 1983 when the predicted force-carrying particles - the massive W and Z bosons - were detected. GUTs imply that at energies greater than about 1024 eV the electroweak and strong nuclear interactions merge into one common force. Such energies far exceed the capabilities of our particle accelerators, but would have existed everywhere in the Big Bang universe during the first 10 ~35 seconds after the initial event. Thereafter, as the universe expanded and cooled, the unified force would have split into the strong force and the elec-troweak force which, in turn, split into the electromagnetic and weak forces. The simplest GUT, proposed in 1973 by Sheldon Glashow (1932- ) and Howard M. Georgi (1947- ), requires the existence of a set of supermassive 'X-parti-cles' that can transform quarks into leptons and vice versa. Since quarks are the basic constituents of protons, the theory predicts that protons themselves must eventually decay into lighter particles. The half-life of a proton is believed to be at least 1032 years, but given enough protons it should be possible at any time to detect the sporadic decay of a few. Experiments are under way to test this prediction; if confirmed, it implies the eventual disintegration of all the familiar chemical elements. Astronomers often determine the masses of astronomical objects such as the Sun, planets, stars and galaxies from their orbital dynamics. But in fact what they actually find is the product of mass and G. The gravitational constant can only be determined by measuring the attraction between known masses in the laboratory. There is no way to screen out forces from masses outside the laboratory so the experimenter must measure a disturbance on the object being tested which is a tiny fraction of the Earth's attraction. Thus the accuracy with which G is known is often the limiting factor in measuring the masses of stars and planets and other astronomical objects. Gran Telescopio Canarias (GTC) Spanish 10.4-m (34-ft) telescope under construction at the ROQUE DE LOS MUCHACHOS OBSERVATORY on the island of La Palma, due for first light in 2003. With its segmented mirror, the instrument closely resembles the 10-m telescopes of the W.M. KECK OBSERVATORY. The project is led by the INSTI-TUTO DE ASTROFlSICA DE CANARIAS with participation from Mexico and the University of Florida. granulation Mottled, cellular pattern that is visible in high-resolution images of the Sun in the white light of the PHOTOSPHERE; it is a result of hot plasma rising from the SOLAR INTERIOR by CONVECTION. The granulation consists of about one million bright convection cells, called granules. The bright centre of each granule indicates hot plasma rising to the photosphere, and its dark edges indicate cooled material descending towards the interior. Individual granules are often polygonal, and they appear and disappear on time scales of about ten minutes. Each granule has an average size of approximately 1000 km (600 mi). Larger convection cells, each about 30,000 km (20,000 mi) across, make up the supergranulation. gravitational constant (G) Fundamental constant in Newton's law of gravitation (see GRAVITATIONAL FORCE). Its value has been determined as G = 6.67259 X 10~u m3/kg s2, with an uncertainty of about 0.00085 X 10~u. gravitational force Mutual attraction between two masses; it is the fourth of the physical forces. In his Principia, NEWTON announced that the force of gravity between any two masses, m1 and m2, is proportional to the product of their masses and inversely proportional to the square of the distance, r, between them: where G is the GRAVITATIONAL CONSTANT. Thus, he was able to link the acceleration with which objects, such as the apocryphal apple, fall to the Earth's surface with the orbital motion of the Moon. gravitational lens Configuration of an observer, an intervening mass and a source of light in which the mass acts as a lens or imaging device for light from the distant source. GENERAL RELATIVITY predicted that a mass (star, galaxy or black hole) situated directly in front of a distant light source (galaxy or quasar) will bend the light and possibly form images of the distant source. The deflection of starlight around the Sun during a solar eclipse was the very first observational confirmation of general relativity, made in 1917 by Sir Arthur Eddington. This prediction and confirmation paved the way for more complex situations, in which light from distant galaxies and quasars might be bent enough by foreground galaxies or stars to form images. This consequence was championed by Fritz ZWICKY in 1937 and was verified in 1979 with the discovery by Dennis Walsh, Robert Carswell and Ray Weymann of the first of the known 'double quasars' (0957+561). gravitational redshift Increase in the wavelength of a photon emitted from an object within a gravitational field. The name arises because in the visible region the wavelength shift is towards the red end of the spectrum. This is not true at longer wavelengths, so the alternative name, Einstein shift, may be preferred. gravitational wave Periodic disturbance in a gravitational field, which, according to EINSTEIN'S theory of GENERAL RELATIVITY, propagates through space at the speed of light. Any changes in a gravitational field are expected to travel at the speed of light so that, for example, if the Sun were to be annihilated, 8m 18s would elapse before the Earth ceased to 'feel' the gravitational influence of the Sun. Just as an accelerating or oscillating charged particle emits electromagnetic waves, so an accelerating, oscillating, or violently-disturbed mass is expected to radiate wave-like gravitational disturbances, which are known as gravitational waves. gravitational wave detector Device intended for the detection of GRAVITATIONAL WAVES. A passing gravitational wave is expected to stretch and squeeze a solid body or to cause small displacements in the separation between two independent masses. In principle, these effects could be measured. In practice, few, if any, events are likely to produce gravitational waves causing displacements (strains) larger than 1 part in 1019. Two masses separated by a metre would thus be moved by an amount far smaller than an atomic nucleus. Current detectors include solid bars (cooled, to minimize noise) and Michelson interferometer systems. The Michelson systems attempt to measure the relative displacement of two or more mirrors attached to test masses, 'freely' suspended in a vacuum, with multiple reflections being used to increase the effective separation between the test masses. Several interferometer-based gravitational wave detectors are currently nearing completion and are expected to be able to detect strains of 10 ~22. So if predictions of the magnitudes of gravitational waves to be expected from astronomical events are correct, then these waves should soon be detected. gravity gradient Rate of change of the strength of a gravitational field with distance. Tidal forces arise through gravity gradients (see TIDES). The gravity gradient at a distance, R, from a mass, M, is proportional to M/R3. Thus the greatest gravity gradients are found close to condensed bodies such as NEUTRON STARS and BLACK HOLES. In the latter case they give rise to HAWKING RADIATION. An artificial satellite with an elongated shape will align itself along the gravity gradient; this can be used to orient the spacecraft. Gravity Probe NASA spacecraft that will be launched in about 2003 to test Einstein's theory of GENERAL RELATIVITY by measuring the precession of gyroscopes in Earth orbit. The development spacecraft has been delayed several years and is still under budgetary scrutiny. The spacecraft will slowly roll about the line of sight to a guide star viewed by a reference telescope, while four gyroscopes, cooled by liquid helium, will compare data from the telescope to an accuracy of 0.1 milliarcsecond. The polar-orbiting satellite is to look for the expected 6.6 arcseconds/year precession to the Earth's rotational axis and the 0.042 arcsecond/year parallel to it. Great Attractor Object that is apparently pulling our LOCAL GROUP of galaxies as well as some nearby clusters towards it. Study of slight temperature differences in the COSMIC MICROWAVE BACKGROUND has revealed that the Local Group is actually moving towards a tremendous concentration of mass nearly 150 million l.y. away, in the direction of the constellation Leo. This concentration of galaxies and dark matter is gravitationally attracting our Local Group of galaxies and thousands of other galaxies in this part of the Universe. The velocity of the Local Group is currently measured as 620 km/s towards the Great Attractor. It is not clear what makes up the dark matter, or exactly how much of the attractor is in dark matter. The only thing that is clear is the tremendous concentration of mass in that part of the Universe. Great Attractor A European Southern Observatory (ESO) image of the central region of ACO 3627, a huge galaxy cluster thought to form part of the Great Attractor. The Great Attractor’s gravitational pull is dragging all the galaxies in our local cluster towards it. great circle Circle on the surface of a sphere whose plane passes through the centre of the sphere and which divides the sphere into two equal hemispheres. Examples of great circles on the celestial sphere are the CELESTIAL EQUATOR and any MERIDIAN (a great circle passing through the poles). Great Debate Culmination, in 1920, of the rivalry between opposing views on the size of the Milky Way and the nature and distance of the 'spiral nebulae'. The Great Debate itself, organized by George Ellery HALE, took place on 1920 April 26 at the National Academy of Sciences in Washington, D.C. The proponents of the rival theories were Heber CURTIS and Harlow SHAPLEY. From his Lick photographic surveys, Curtis had discovered that 'spiral nebulae' were scarce along the galactic plane - the zone of avoidance; also, many spirals showed dark dust lanes along their horizontal planes, as were apparent in the Milky Way. These observations and his spectroscopic work convinced Curtis that bright, diffuse nebulae were relatively close, lying inside the Milky Way galaxy, but that the spirals were other galaxies, 'island universes' or 'external galaxies', at much greater distances. This theory was at variance with the 'metagalaxy' model proposed by Shapley, which, though it correctly placed the Solar System far from the galactic centre, held that the Galaxy was an immense 300,000 l.y. 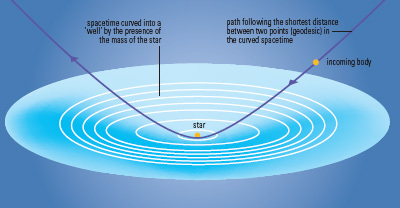 across (Curtis' model, following Jacobus KAPTEYN's, called for a smaller Milky Way.) Spiral nebulae belonged to our own Galaxy, Shapley maintained, partly because measurements of their rotational velocities by Adriaan VAN MAANEN - later shown to be in error - indicated that if these systems were as distant as Curtis believed, their outer regions must be rotating well in excess of the speed of light. The matter was resolved in 1924-25, when Edwin HUBBLE used CEPHEID VARIABLE stars in the Andromeda Galaxy (M31) to show that this galaxy was much farther than even the radius of Shapley's 'metagalaxy', vindicating Curtis' views. greatest elongation Maximum angular distance, east or west, measured between an INFERIOR PLANET and the Sun, as viewed from Earth. This varies between 18° and 28° for Mercury, and 45° to 47° for Venus. When at greatest ELONGATION east, the two planets set at their latest time after the Sun, and when at greatest elongation west, they rise at their earliest time before it. Great Observatories NASA's description of a major astronomical programme involving four space telescopes - the HUBBLE SPACE TELESCOPE (1990), the COMPTON GAMMA RAY OBSERVATORY (1991), the CHANDRA X-RAY OBSERVATORY (1999) and the SPACE INFRARED TELESCOPE FACILITY (2002). Great Red Spot (GRS) Largest and longest-lasting atmospheric feature on JUPITER. It is a huge anti-cyclonically rotating meteorological eddy, which currently is 24,000 km (15,000 mi) long and 11,000 km (7000 mi) wide and centred at a latitude of 22°S. The Great Red Spot has been observed by ground-based observers for more than 300 years. First reported by Robert Hooke in 1664, it was followed for several years by G.D. Cassini. Drawings by Heinrich Schwabe in 1831, William Dawes in 1851, and Alfred Mayer and the fourth Earl of Rosse in the 1870s all show the Red Spot. The feature became quite prominent in the 1890s, and British Astronomical Association records contain extensive data from that time to the present. Green Bank Telescope (GBT), the world's largest fully steerable radio dish, a facility of the NATIONAL RADIO ASTRONOMY OBSERVATORY. Dedicated in 2000 August, the GBT replaced a 90-m (300-ft) dish built in 1962 that collapsed without warning in 1988. It has an unusual design, with a main dish measuring 100 X 110 m (330 X 360 ft) that reflects the incoming radiation to an off-axis feed arm. There is no central obstruction as in a conventional radio telescope, and the response pattern is greatly improved. The two thousand panels making up the reflective surface are individually controlled by computer-driven actuators. green flash Purely atmospheric phenomenon in which the last visible remnant of the setting Sun may suddenly appear to change from red to vivid green for a few seconds as it sinks below the horizon. At higher latitudes, where the Sun sets at a shallow angle, the green flash may last for several seconds. Visibility of the green flash is strongly dependent on atmospheric conditions; stable layering of air over a clear sea horizon during the summer appears to particularly favour its occurrence. A green flash can also occur at sunrise. Like the Sun, the bright planet Venus can also be seen to produce a green flash under favourable conditions as it sets. greenhouse effect Phenomenon whereby the surface of a planet is heated by the trapping of infrared radiation by the ATMOSPHERE. This mechanism is important in the atmospheres of the Earth, Venus and Titan. On Earth, the most important greenhouse gases are carbon dioxide and water vapour, with significant contributions from methane, nitrous oxide, ozone, and anthropogenic hydrofluorocarbons, perfluorocarbons and sulphur hexafluoride. These gases are transparent to the shortwave radiation from the Sun but absorb longer wavelength infrared radiation from the surface, re-emitting this radiation to the atmosphere and surface, thus raising the overall temperature. 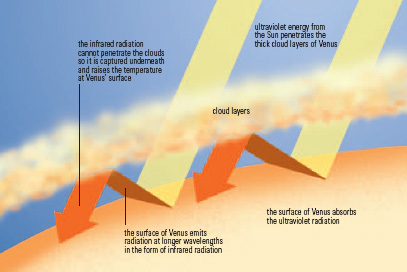 In the absence of an atmosphere, the Earth would have an average temperature of c.256 K instead of 290 K. Carbon dioxide (CO2) is thought to have played a significant role in the early atmospheres of all the terrestrial planets, and it is currently responsible for the extremely high surface temperature of Venus (737 K). The burning of fossil fuels is rapidly increasing the amount of CO2 in the Earth's atmosphere. greenhouse effect Shortwave radiation from the Sun readily penetrates the atmosphere to reach the ground. Longer wavelength radiation re-emitted from the ground is trapped by atmospheric constituents such as carbon dioxide, raising the planetary temperature. This greenhouse effect is significant in keeping Earth habitable, but has led to inhospitably high temperatures on Venus. Greenstein, Jesse Leonard (1909- ) American astronomer who spent his career at Yerkes Observatory and CalTech's Mount Wilson and Palomar Observatories. He used spectroscopy to study stars with peculiar spectra, the abundances of chemical elements in stellar atmospheres, the interstellar medium and the composition of nebulae. From these studies he developed a theory of free—free transitions in hot, highly ionized gases. Greenstein became an authority on stars made from degenerate matter, including white dwarfs, studying their masses and luminosities. He helped Maarten schmidt to make the first definitive identifications of quasars' optical counterparts. Greenwich Mean Time (GMT) Name given to mean solar time at the Greenwich meridian; it is the popular name for civil time kept in the UK. The need for a standard time across the country came with the development of the railways, from 1825 onwards. For example, passengers travelling from Bristol to London would find a ten-minute difference between the time kept in the two cities because local time, measured according to the position of the Sun in the sky, varies with longitude. Eventually the railways adopted Greenwich time, which became known as 'railway time', as their standard and in 1880 it became the legal time for the whole country. In 1928 the international astronomical union (IAU) recommended that Greenwich Mean Time should become the standard timescale for scientific purposes and be known as universal time (UT). Today, Greenwich Mean Time is still the standard against which the system of time zones around the globe is measured, each one being an integral number of hours ahead of or behind it. Greenwich Observatory Britain's former Royal Observatory, founded in 1675 by Charles II to make accurate positional measurements of stars for use in maritime navigation. The purpose-built observatory at Greenwich, London by the architect-scientist Christopher Wren (1632—1723) also provided accommodation for the first Astronomer Royal, John flamsteed, who was paid Ј100 per year yet had to fund the cost of instruments and assistants from his own pocket. In 1766 the first Nautical Almanac was published under the guidance of Nevil maskelyne, fulfilling King Charles' ambition. Throughout most of the 18th and 19th centuries, the Royal Observatory remained dedicated to positional astronomy. Investigations of the physical nature of celestial objects began in the late 19th century under the directorship of William christie. He installed a 0.71-m (28-in.) refractor in the famous Onion Dome, and founded the Physical Observatory, equipping it with a 0.66-m (26-in.) photographic refractor and a 0.76-m (30-in.) reflector. To these were added the 0.91-m (36-in.) Yapp Reflector in 1934, but by then the observing conditions in London skies were deteriorating. Plans to move away from the capital were not acted upon until 1948, when Harold Spencer jones took up residence at Herstmonceux Castle, Sussex, at the start of a ten-year transfer from Greenwich. The institution became the royal greenwich observatory (RGO), and continued most of the activities previously carried out at Greenwich, including the time service. The old observatory buildings, known today as the Royal Observatory Greenwich, were developed into a museum as part of the National Maritime Museum. Its main attraction for many visitors is the Prime Meridian of the world. Gregorian calendar System devised by Pope Gregory XIII in 1582, and still in use today, which corrected errors in the previously used julian calendar. By 1582 the Julian calendar, which approximated the actual solar year of 365.24219 days to a calendar year of 365.25 days with a leap year every fourth year, had accumulated an error of 10 days. Pope Gregory XIII therefore removed 10 days from the calendar, so that in 1582 October 15 followed October 4. He instigated a new system in which only century years divisible by 400 (that is, 1600, 2000 and so on) would be leap years. The start of the year was also changed from March 25 to January 1. The Gregorian calendar was not adopted in the UK, however, until 1752, by which time the error had increased to 11 days, so that September 14 followed September 2. Today the Gregorian calendar is used throughout the Western world and parts of Asia. It is also known as the Christian calendar since it uses the birth of Christ as a starting point, subsequent dates being designated anno domini (in the year of our Lord) and preceding dates being bc (before Christ). The accumulated error between the Gregorian year and the true solar year now amounts to just three days in 10,000 years. Gregorian telescope Type of reflecting telescope designed in 1663 by Scottish astronomer James gregory. A parabolic primary mirror with a central hole reflects light to a concave elliptical secondary placed outside the focus, and thence back through the hole to an eyepiece behind the primary where it gives an erect image. It was popular in the 17th and 18th centuries with telescope-makers such as James short, as the secondary was easier to make than the convex secondary required for the cassegrain telescope, and the tube length was shorter than that of a newtonian telescope. It is not much used today. Gregory, David (1659—1708) Scottish mathematician and nephew of James gregory. He proposed a variety of telescope designs, including ways of making a telescope free from chromatic aberration. Gregory was a strong supporter of Isaac Newton's theories of calculus and mechanics, publishing a comprehensive summary of those ideas, entitled Astronomiae physicae et geometricae elementa (1702). His main astronomical interests lay in the newly founded study of optics, also greatly advanced by Newton. Gregory, James (1638—75) Scottish mathematician who developed many of the fundamental tools of calculus. In his Optica promota (1663) he covered such diverse astronomical topics as elliptical orbits, transits of planets and the determination of parallax, and described a design for a new kind of telescope (see gregorian telescope). Gregory also experimented with the very first example of a diffraction grating, using a fine sea bird's feather to project the image of the spectrum of sunlight on to a wall in a darkened room. David gregory was his nephew. Grigg-Skjellerup, Comet 26P/ Short-period comet, initially discovered on 1902 July 23 by John Grigg (1838—1920), New Zealand. Poor weather restricted observations at the discovery apparition and prevented derivation of a true orbit. A comet discovered on 1922 May 17 by John Francis Skjellerup (1875—1952), South Africa, was found to be identical, and an elliptical orbit determined. The comet is usually faint. It has had its perihelion distance gradually increased to 0.99 AU following encounters with Jupiter. The current period is 5.11 years. Close approaches to Earth have given rise to periodic displays of Pi Puppid meteors around April 23, as in 1972 and 1977. The giotto spacecraft passed through the tail of 26P/Grigg—Skjellerup on 1992 July 10, finding a lower-than-expected dust density in the comet's vicinity. Grimaldi Lunar impact basin (6°S 68°W), 193 km (120 mi) in diameter, with rim components reaching 2750 m (9000 ft) above its floor. Grimaldi has two rings, both so deeply eroded by later impacts that in some places they are difficult to identify. The floor of Grimaldi is smooth, dark and almost featureless as a result of lava resurfacing. Indeed, it is one of the darkest regions on the lunar surface. A number of rilles, called Rimae Grimaldi, are found on Grimaldi's floor. GRS Abbreviation of GREAT RED SPOT Grubb, Parsons & Co. Irish telescope-making firm formed by the merger (1925) of firms founded by Thomas and Howard Grubb and Charles Parsons. Thomas Grubb (1800-1878) began making small astronomical telescopes in the 1840s, experimenting with reflector designs at a time when refractors were more popular. He became proficient at constructing sturdy equatorial mountings for large instruments. In 1834 Thomas Romney Robinson (1792-1882) ordered from Grubb a 15-inch (380-mm) Cassegrain reflector for the ARMAGH OBSERVATORY. This was the first large Cassegrain instrument, and the first large reflector to be carried on a polar axis equipped with a clock drive. In 1865 Howard Grubb (1844-1931) joined his father as a telescope-maker, and took over the running of the business in 1868. The next year, the Grubbs completed the 48-inch (1.2-m) Melbourne Reflector. Another of their famous instruments was the 27-inch (0.69-m) refractor for the Vienna Observatory (1880). In 1901 they finished the Radcliffe Telescope for Oxford University's Radcliffe Observatory, consisting of two refractor tube assemblies, a 24-inch (0.6-m) instrument for visual observations and a 17 -inch (0.45-m) photographic telescope, carried on a German equatorial mounting. Several of the 'astrograph' photographic refractors used for the carte du ciel sky-mapping project were made by Grubb. In 1925 Howard retired and his telescope making business was taken over by Charles Algernon Parsons (1854-1931), son of the Third Earl of ROSSE and famous as the inventor of the steam turbine engine. The company was renamed Grubb, Parsons & Co. and continued to make many large telescopes, the last of which (1987) was the Royal Greenwich Observatory's 4.2-m (165-in.) WILLIAM HERSCHEL TELESCOPE erected on La Palma, in the Canary Islands. G star Any member of a class of yellow-white stars, the spectra of which are characterized by relatively weak hydrogen lines, strong ionized calcium lines (FRAUNHOFER LINES H and K), and, as temperature declines, the beginning of strong neutral calcium and sodium lines (Fraunhofer g and D). MAIN-SEQUENCE dwarf stars range from 5300 K at G9 to 5900 K at G0, with zero-age masses from 0.9 solar mass to just over solar, zero-age luminosities from 0.5 to just above solar, and dwarf lifetimes from 10 billion years to greater than the age of the Galaxy. Giants and supergiants, which, because of lower densities, are about 800 K cooler than the dwarfs, are more difficult to distinguish spectroscopically than in other classes. However, the Wilson-Bappu effect (see KSTAR) can yield luminosities. G SUBDWARFS have weakened metal lines and lower metal abundances. The Sun is a G2 dwarf, allowing a good understanding of G stars. G stars have deep convection zones, the Sun's occupying its outer third. Although they tend to be slow rotators (unless in binary systems where they are tidally spun up), G stars have active magnetic fields, which produce CHROMOSPHERES and hot CORONAE. The solar magnetic field is amplified within the Sun. Ropes of magnetic flux float upwards and produce SUNSPOTS where they exit and re-enter the Sun. Interacting and collapsing magnetic fields create bright solar FLARES, releasing the magnetically confined corona in CORONAL MASS EJECTIONS. Chromospheres produce EMISSION LINES. Stellar chromospheres can be recognized by emissions set within the calcium H and K absorptions; coronae can be confirmed through X-ray emission. About two-thirds of the G dwarfs exhibit Sun-like activity. The highest luminosity (and longest period) Cepheids are class G supergiants. Numerous planets have been found orbiting G stars. Bright examples of G stars include the Sun (G2 V), Alpha Centauri-A (G2 V) and Capella (G0 III + G8 III). Guardians of the Pole Name sometimes given to the stars p and y Ursae Minoris (KOCHAB and Pherkad), which form part of the bowl of the Little Dipper, Ursa Minor. guide star Star on which a GUIDE TELESCOPE is tracked to ensure that the main telescope is accurately aligned on its target for the duration of an astronomical exposure. Guide Star Catalogue (GSC) Catalogue created for the control and target acquisition of the Hubble Space Telescope in 1990, containing positions and magnitudes for about 20 million stars; it is mainly used for astromet-ric calibration. A second-generation catalogue, the GSC-ii, will include the positions, proper motions, magnitudes in three colours and star/galaxy classifications for about 1 billion objects. guide telescope Smaller telescope mounted on the side of a main instrument and used for viewing a field star, the guide star, near the target object. By watching the position of the guide star relative to cross-wires in the guide telescope's eyepiece, the observer can make adjustments to the DRIVE motion, ensuring that the target remains centred. An OFF-AXIS GUIDER may also be used, while modern instruments (both professional and amateur) are increasingly being equipped with CCD-based AUTOGUIDERS. Gum Nebula Extensive faint nebula in the southern constellations of Puppis and Vela. It spans an angular diameter of 36°, making it the largest nebula in the sky. Named after its discoverer, the Australian astronomer Colin Stanley Gum (1924-60), the nebula lies at a distance of 1300 l.y. and has a true extent of 840 l.y. The ancient Vela supernova remnant is part of the Gum Nebula. Guth, Alan Harvey (1947- ) American cosmologist and particle physicist at Massachusetts Institute of Technology, with Andrei LINDE one of the principal conceivers of INFLATION, a process hypothesized to have operated in the very early universe (up to just 10 -37 seconds after the BIG BANG). By providing an initial period of rapid expansion, inflation accounts for observed properties of the Big Bang Universe. Guth has also developed a theory of cosmological phase transitions to explain how the Universe's symmetry altered in its earliest moments. GRUS (gen. gruis, abbr. gru) Small but not inconspicuous southern constellation, representing a crane, between Piscis Austrinus and Tucana. Grus was introduced by Keyser and de Houtman at the end of the 16th century. Its brightest star, Alnair, is mag. 1.7. The constellation contains two naked-eye optical double stars: 8 Gru, which has yellow and red components, mags. 4.0 and 4.1, separation about 13'; and j Gru, two yellow stars, mags. 4.8 and 5.1, about 17' apart.